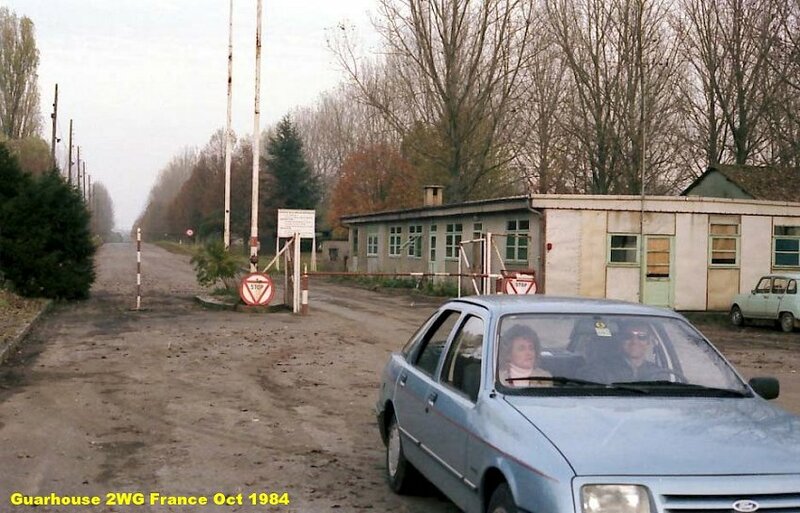 The guardhouse at the main gate - October 1984. 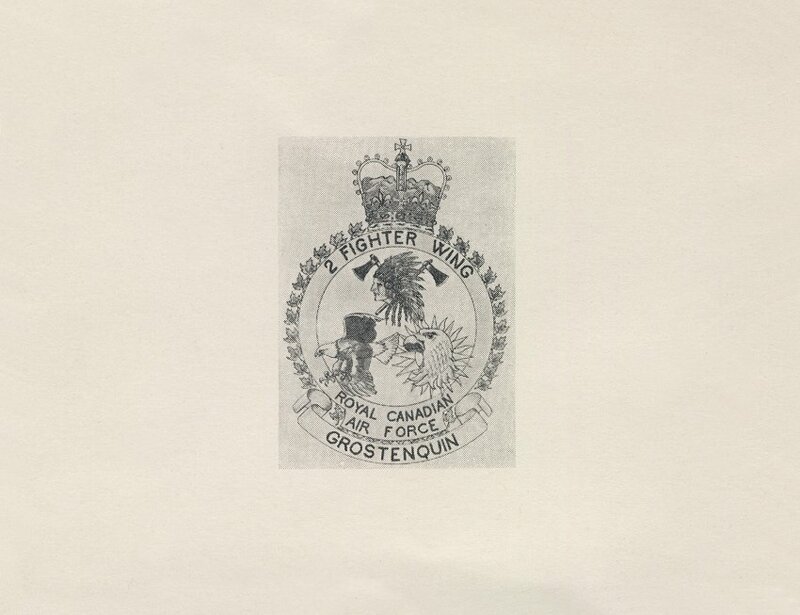 Extracts from 2 Wing Historical Reports pertaining to the Military Police. 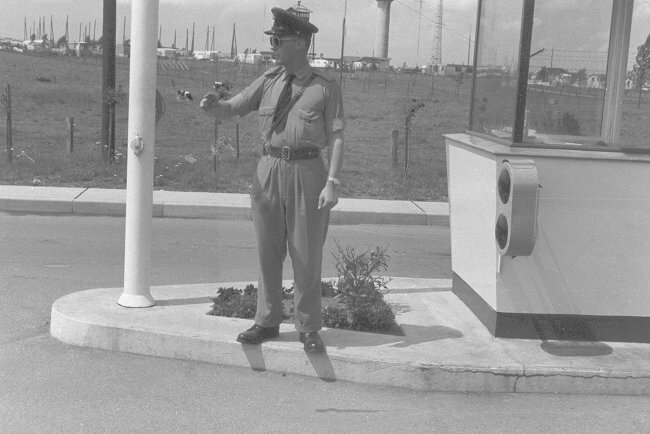 RJ Montpetit on duty - March 1964.
RJ Montpetit controlling traffic at the main gate - March 1964. 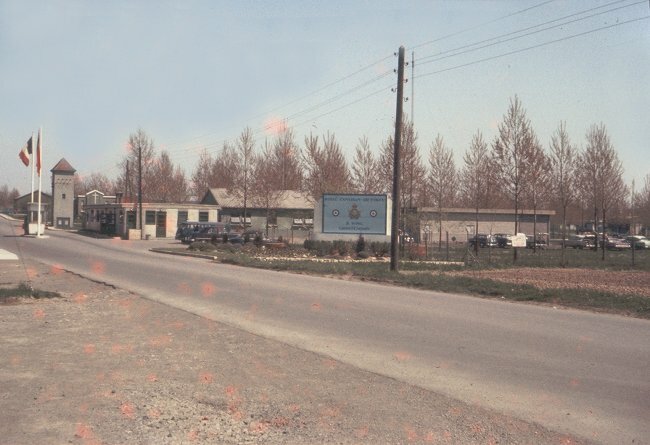 Approaching the main gate at 2 Wing - March 1964. 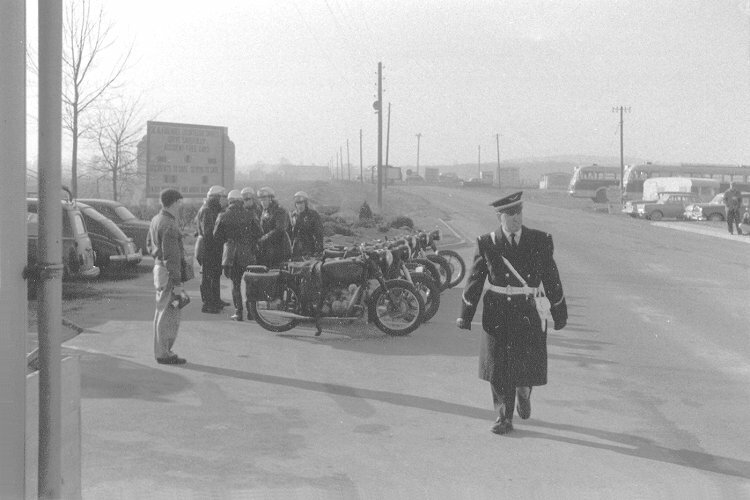 French Gendarmes at the main gate - March 1964. 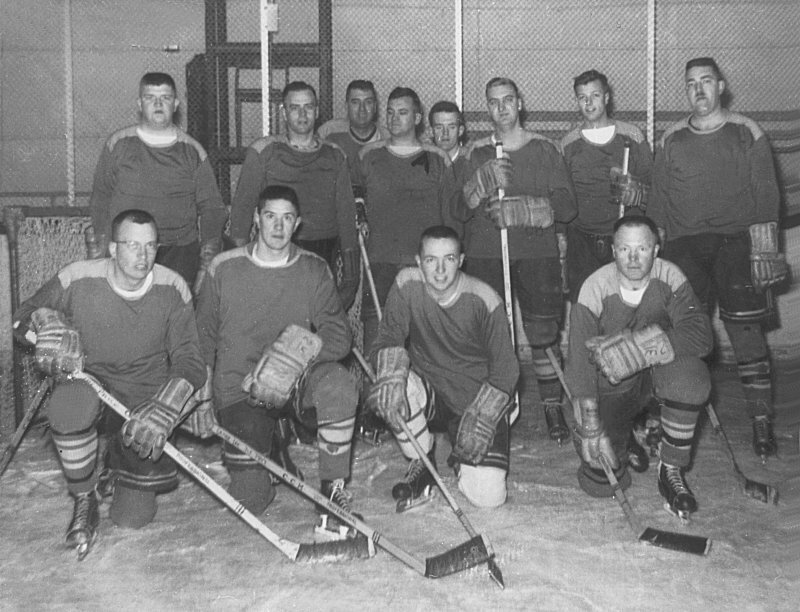 2 Wing RCAF Air Force Police - February 1964. 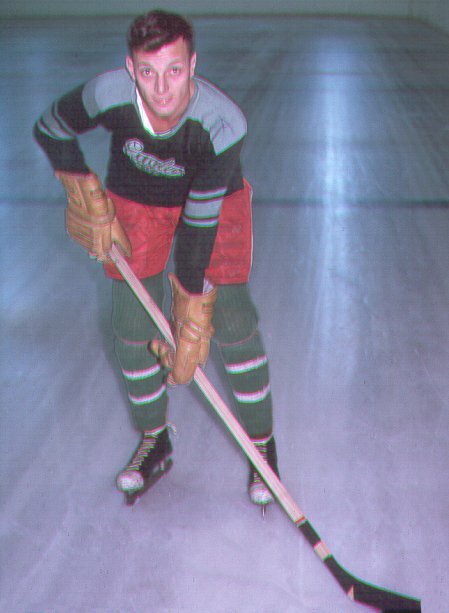 Courtesy Joseph Montpetit and John Heyes. 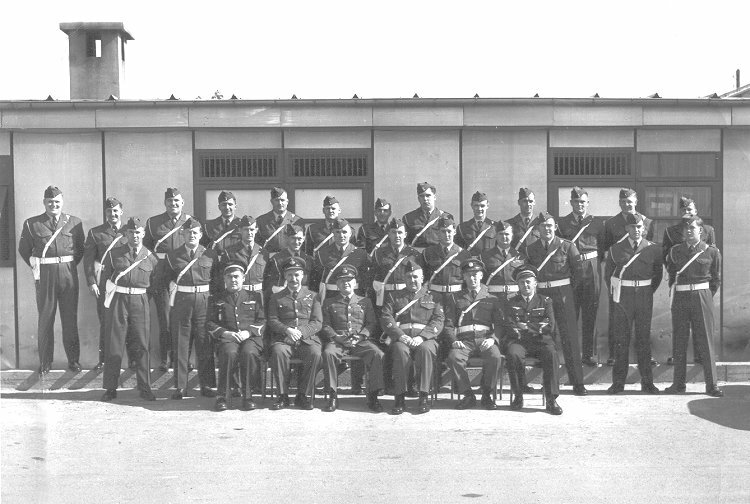 Larger image of Air Force Police - February 1964. Courtesy Joseph Montpetit abd John Heyes. 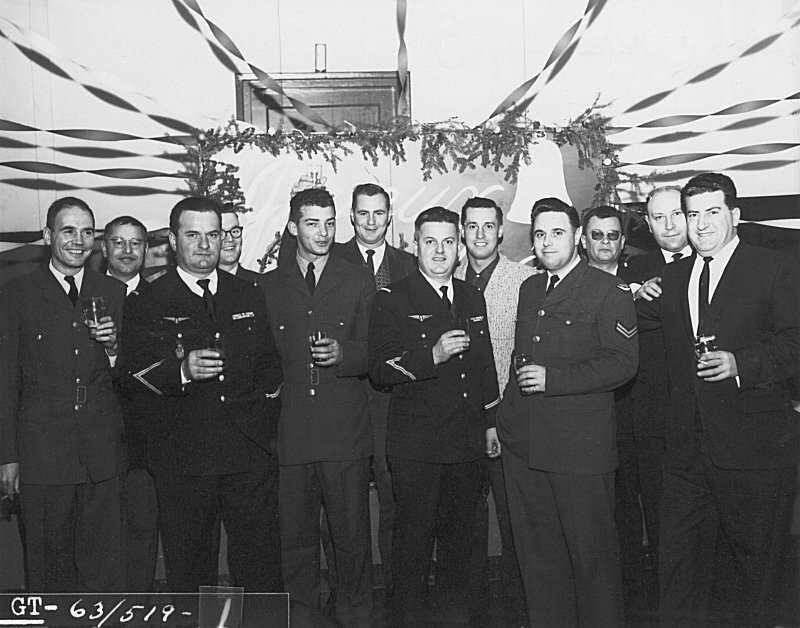 French Gendarme Christmas party - 6 December 1963. 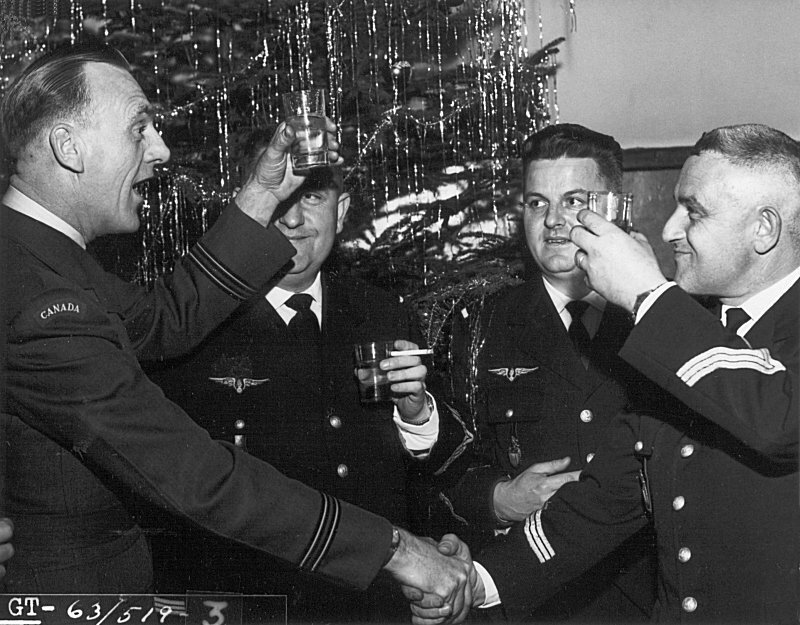 F/L VJ Heyes (WSecO) toasts a "new year" with French Gendarmes - 6 December 1963. 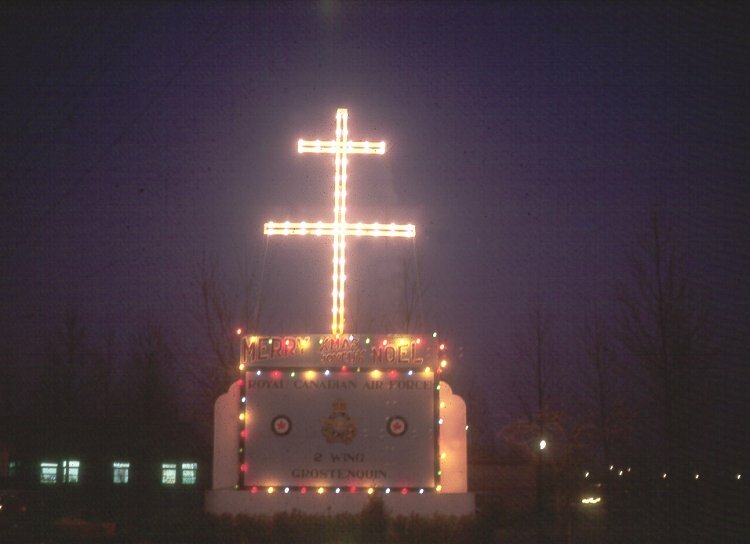 A night view of the station sign decorated for Christmas - December 1963. 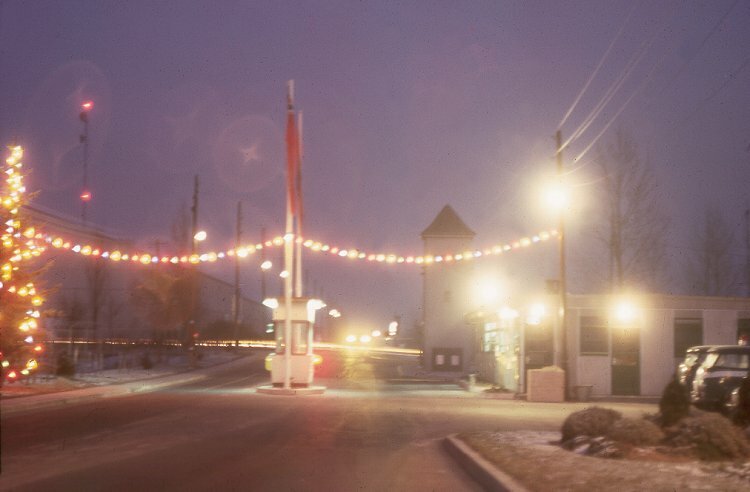 A night view of the main gate area at 2 Wing decorated for Christmas - December 1963. 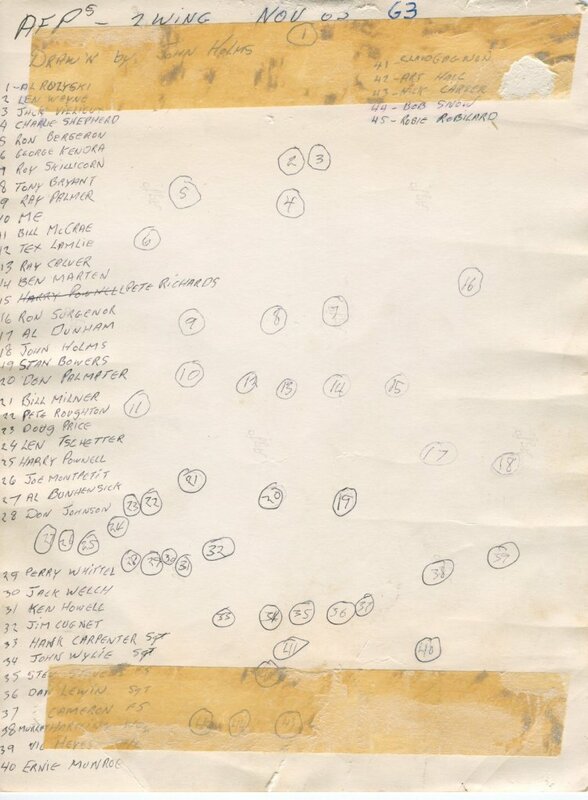 AFPs at 2 Wing (drawn by John Holmes) - 3 November 1963. 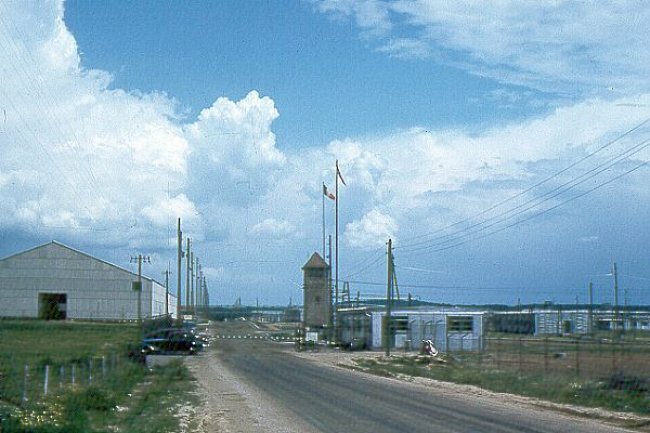 Larger image of AFPs at 2 Wing - 3 November 1963. 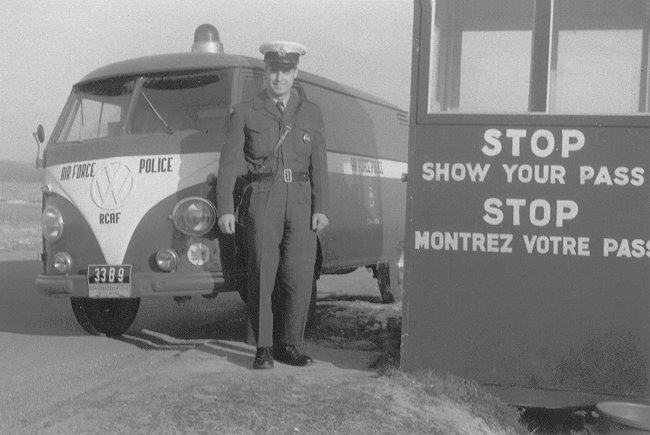 F/L Vic Heyes chatting with a Gendarme at the entrance to the station - October 1963. 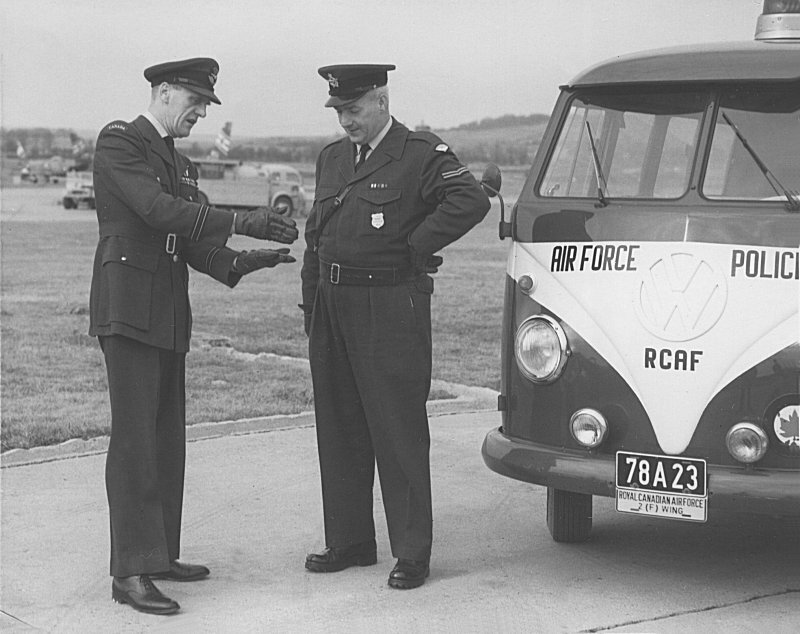 F/L Vic Heyes with a Gendarme talking with the driver of an AFP vehicle - October 1963. F/L Vic Heyes and family going through the main gate on vacation - October 1963. The entrance to the station - October 1963. 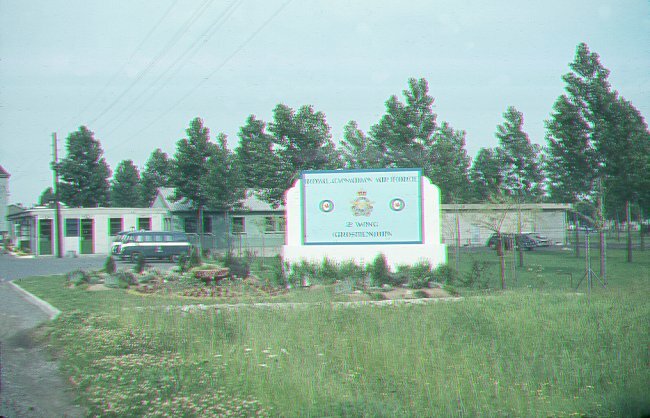 The "station sign" at the main gate of the station - June 1963. The entrance to the station - June 1963. Does this mean I can't get in? - April 1963. 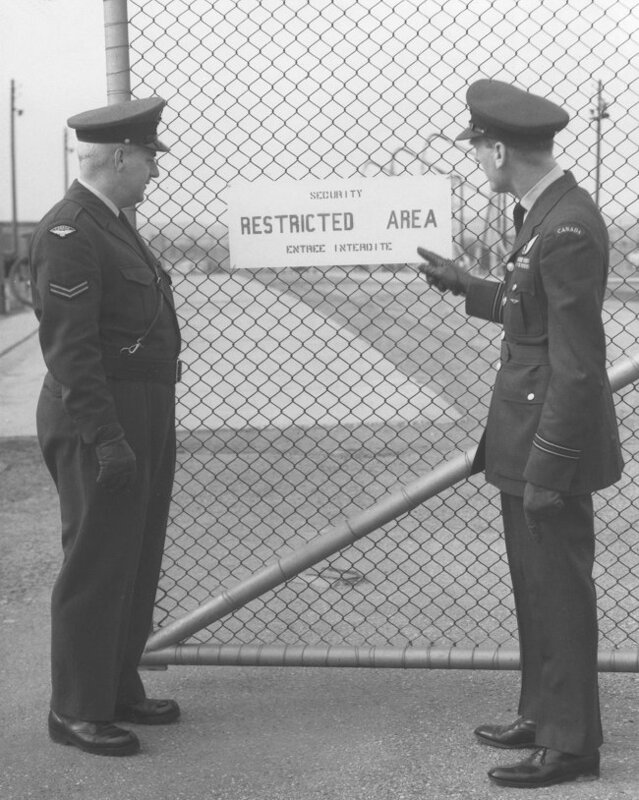 (L-R) - Cpl Surgenor and F/L VJ Heyes (WSecO) discuss security measures for vital restricted areas during alert conditions. 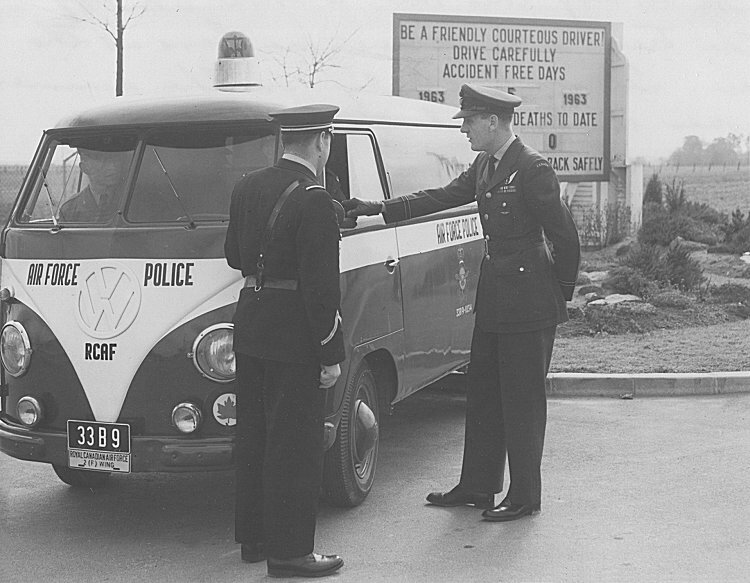 F/L VJ Heyes (WSecO) getting his point across to Cpl Maule - March 1963. WSeco briefing the "desk NCO" on an anticipated security situation. The "Desk NCO" directed all police activity of the shift and logged all incidents. 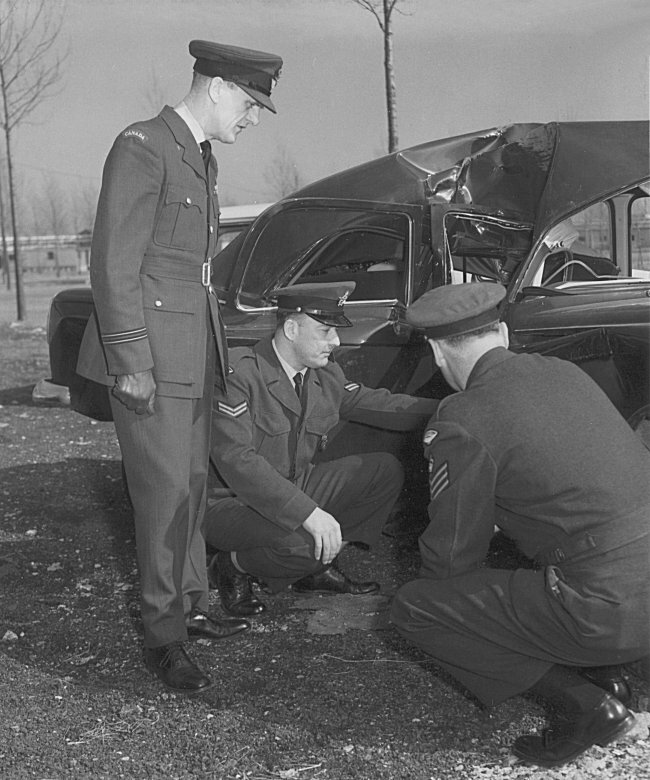 Anoher RCAF owned vehicle involved in an accident - March 1963. (L-R) - F/L VJ Heyes (WSecO), Cpl Milner (NCO i/c Investigations), FS Cameron (NCO i/c AFP). General discussion about the cause of the accident. 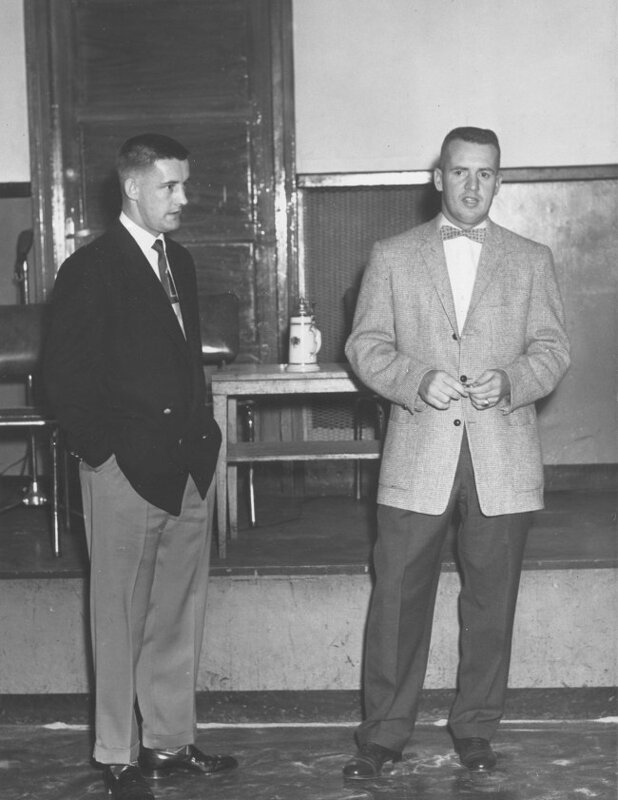 F/L VJ Heyes (WSecO) and Cpl Surgenor discuss security issues - March 1963. Note the aircraft and refuelling activity in the background. 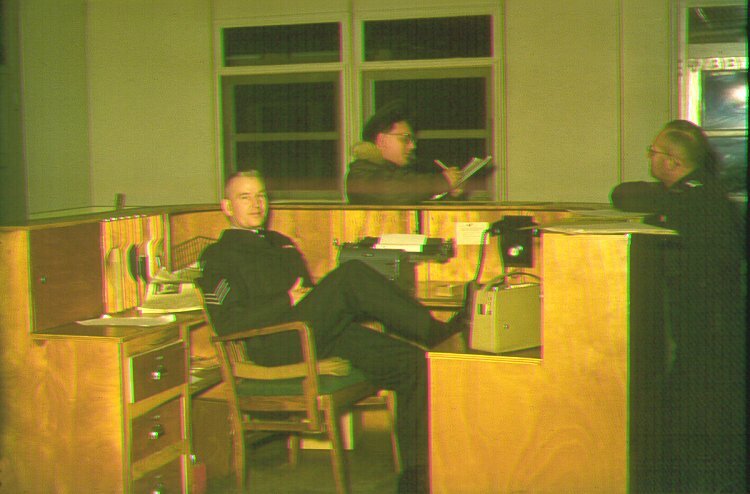 The front desk inside the guardhouse - February 1963. 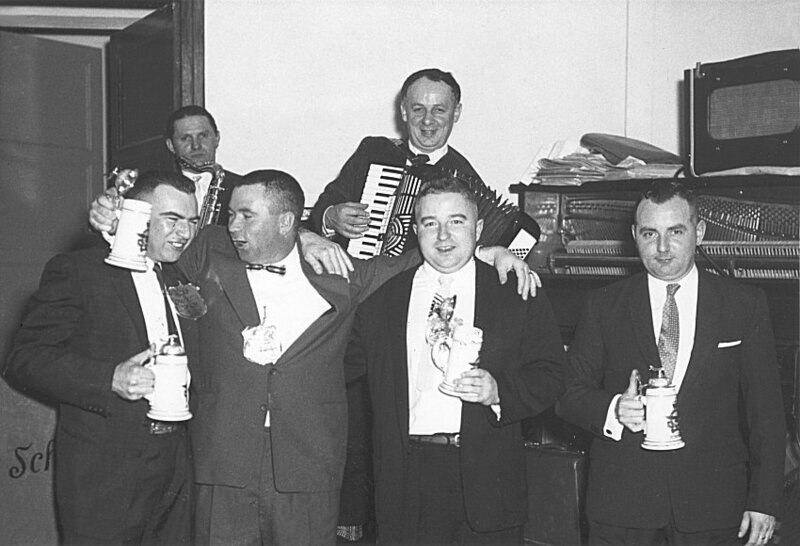 (L-R) Sgt Jack Fowler, Al Ruzyski, Paul Carmichael. (L-R) Ron Surgenor, Bill Milner. 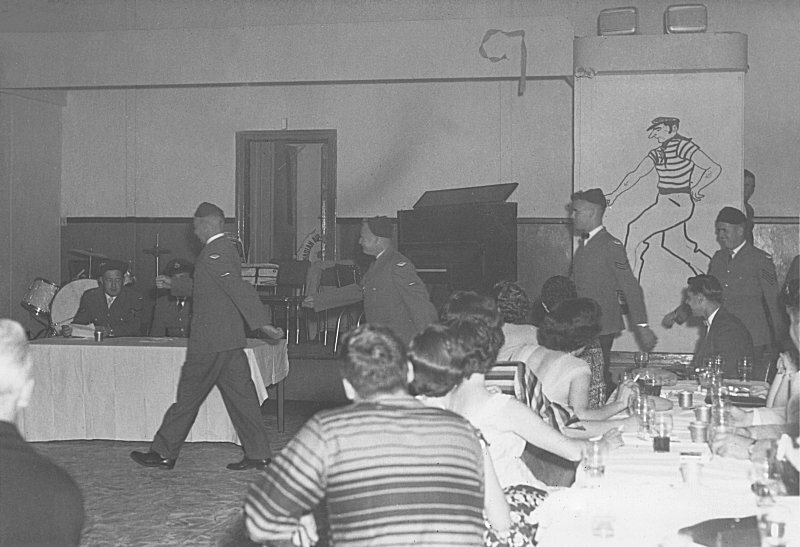 The coffee room at the guardhouse - February 1963. Sgt Jack Fowler with our mascot. 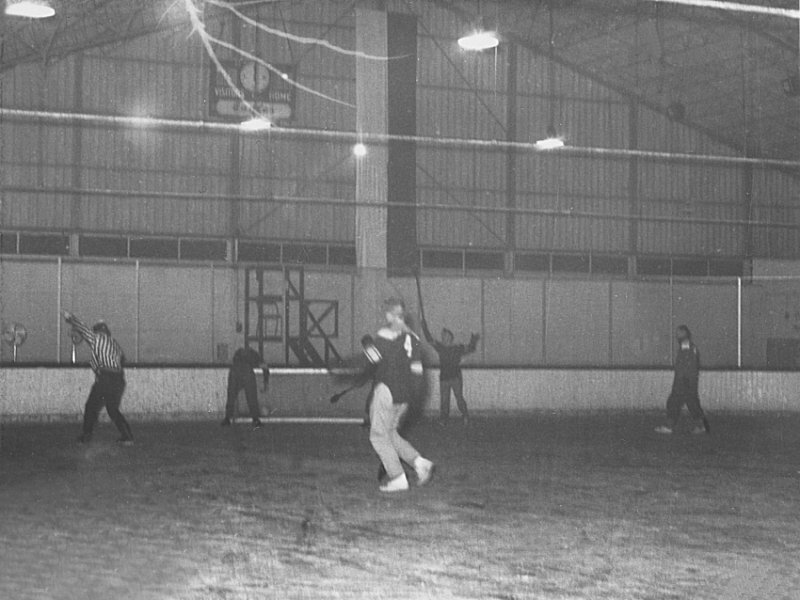 Larger image of the previous photo - January 1963. 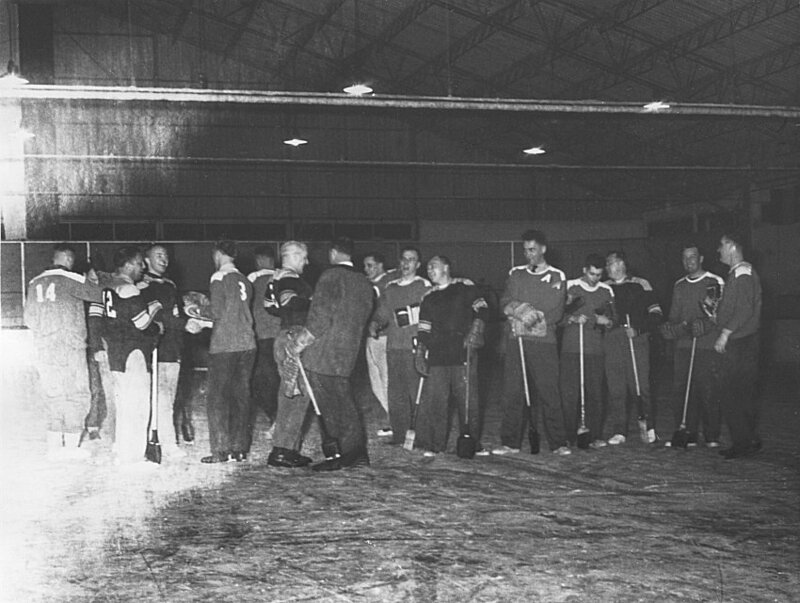 AFP Hockey Rally - January 1963. 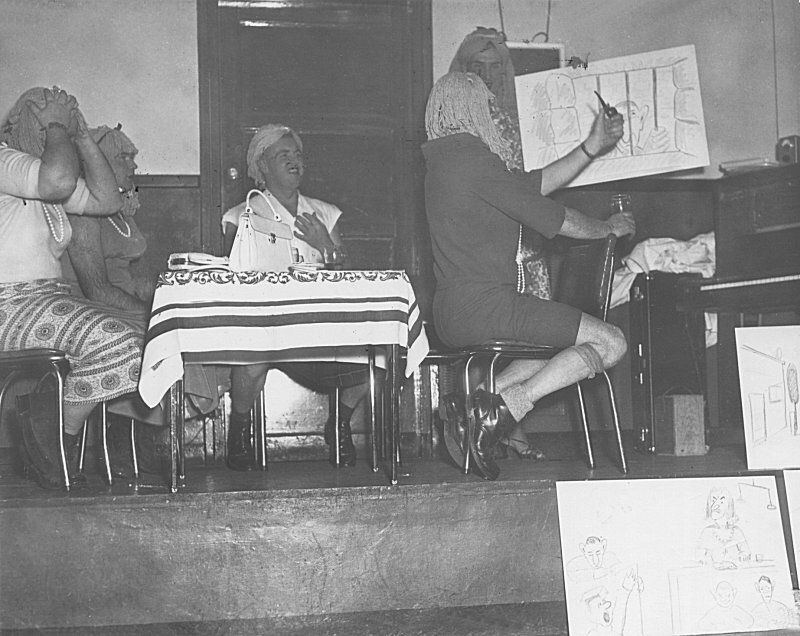 Mrs Margaret Heyes (leaning at table) FS & Mrs Cameron. Front of hand drawn Christmas card - December 1962. 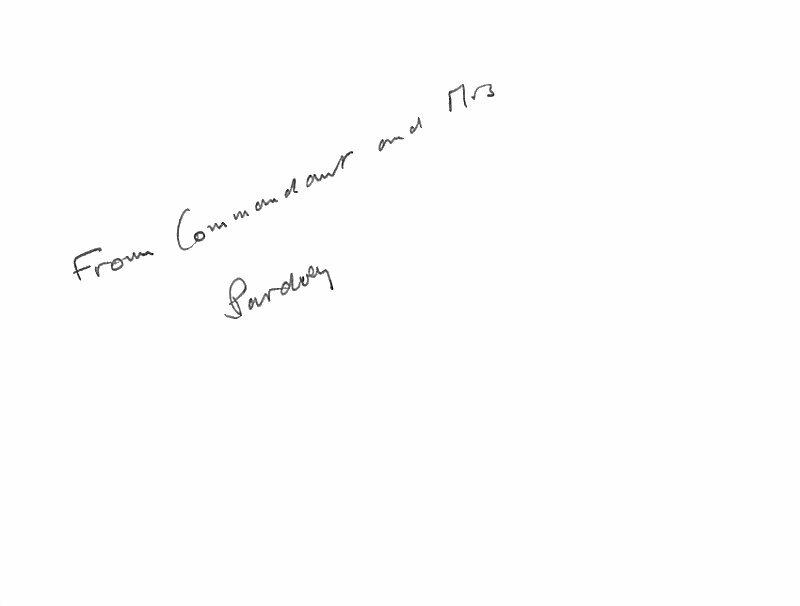 This card was sent from the French Gendarmes at Faulquemont to the 2 Wing AFPs. Interior of the Christmas card - December 1962. 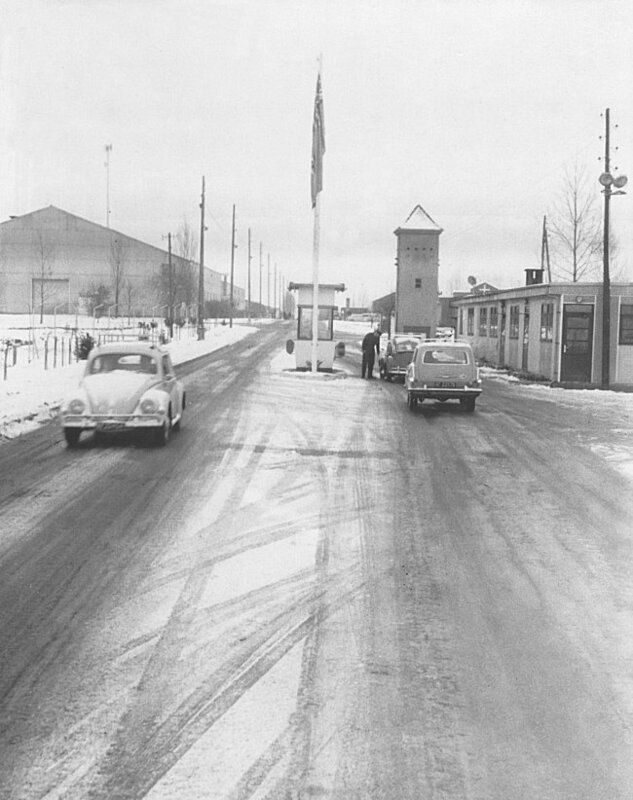 Vehicles arriving and departing from the main gate - December 1962. 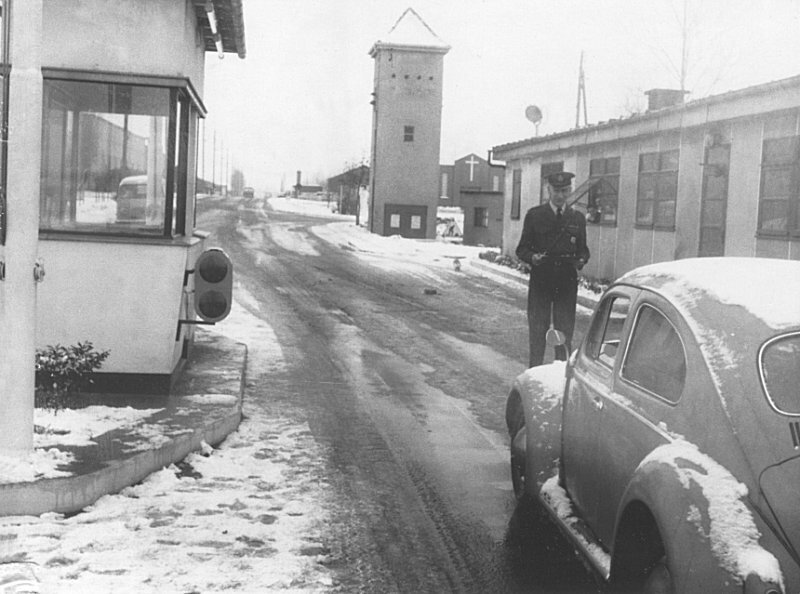 Vehicle being checked on arrival at the main gate - December 1962. 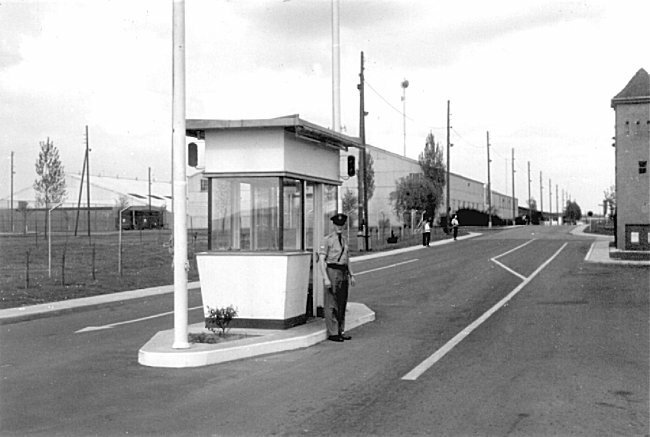 The "safety sign" at the main gate - December 1962. 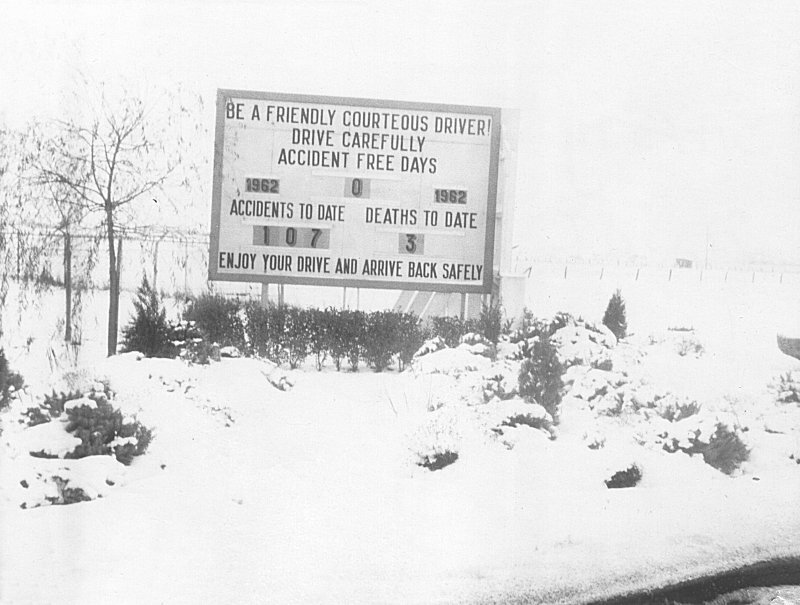 More than likely a discussion about the driving conditions - December 1962. 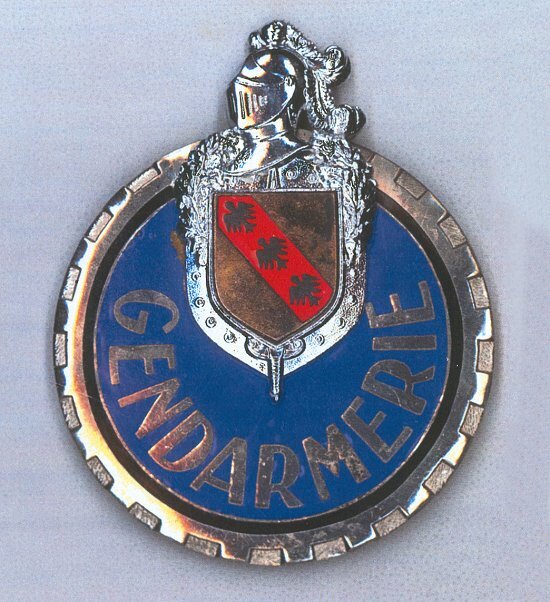 A badge worn by the Gendarmes at 2 Wing - 1962. 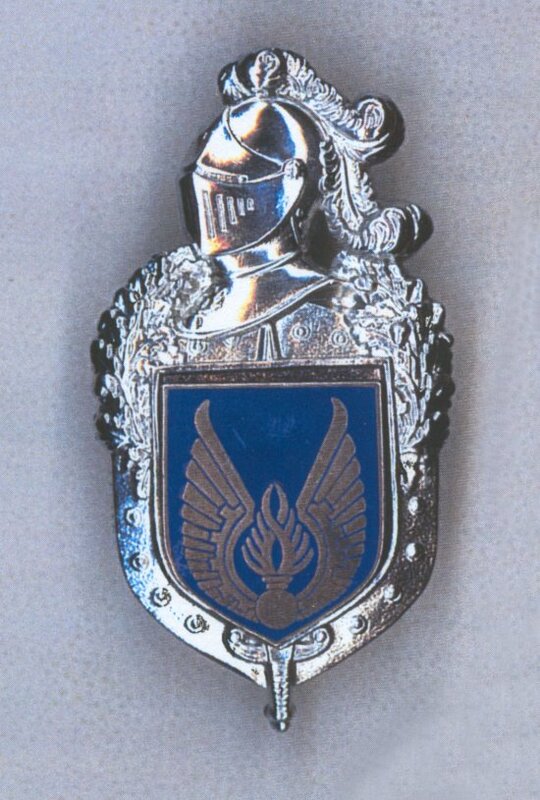 One of these was presented to F/L VJ Heyes (WSecO) in recognition of the ongoing liaison between the RCAF AFPs and the Air Gendarmes. 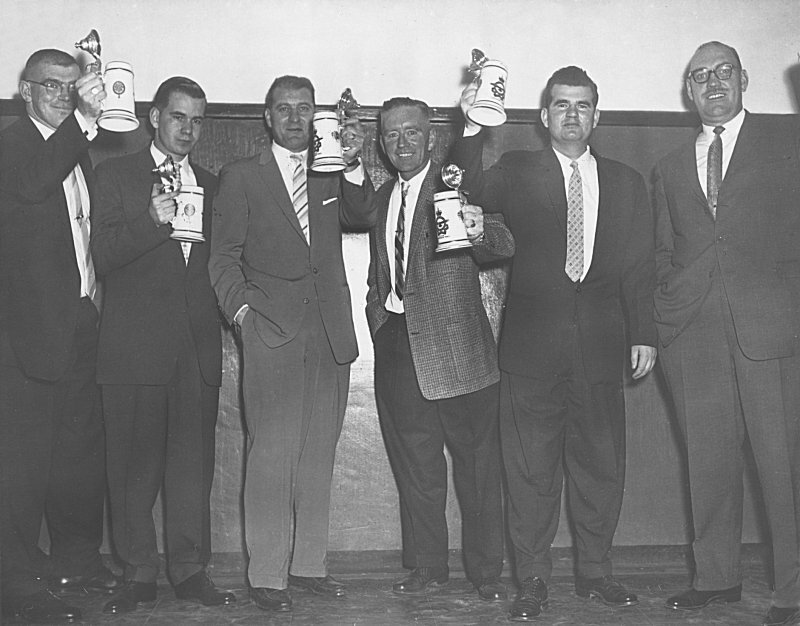 "A spot of tea" after our joyous victory - November 1962. 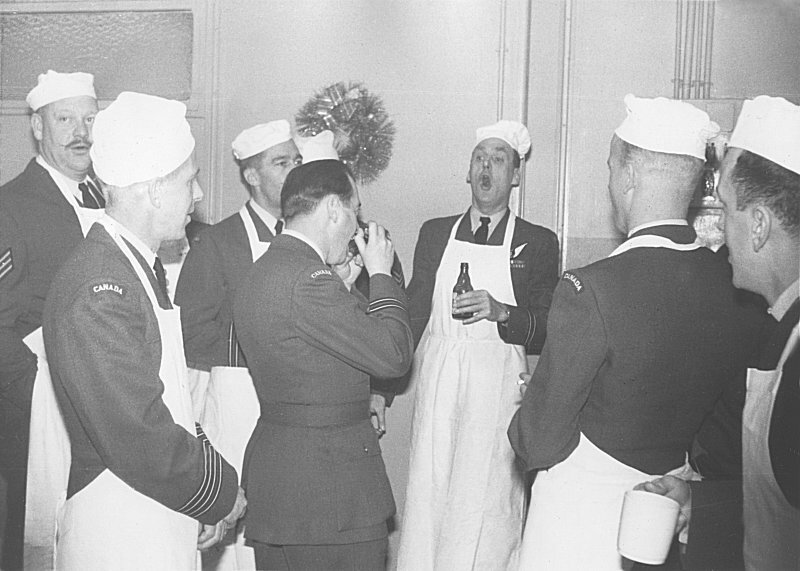 One must learn to "keep their mouth shut" when working with the AFPs - October 1962. 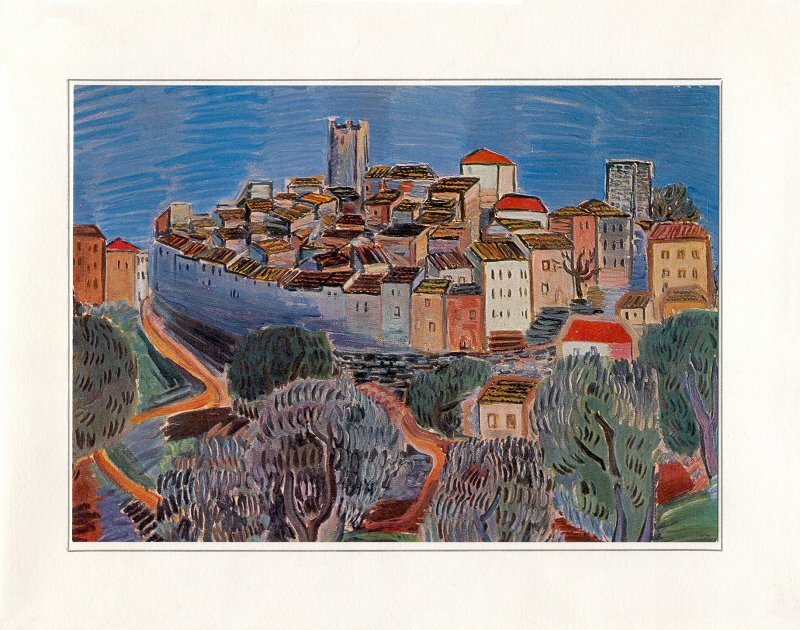 Marie Vedder was a civilian French national who worked at the guard house. 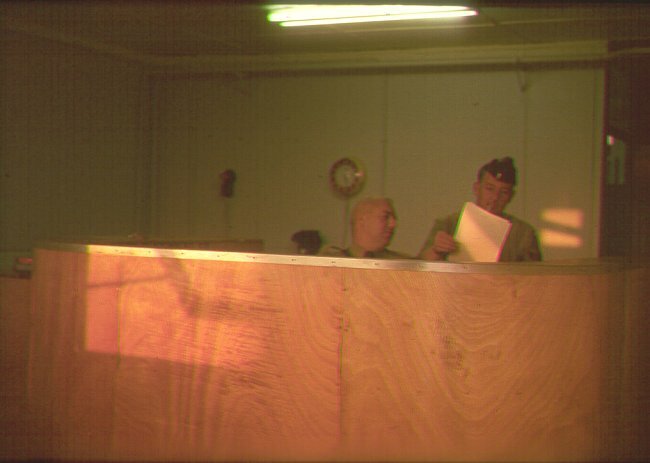 AFP "target practice" at the range with 9mm pistols - August 1962. 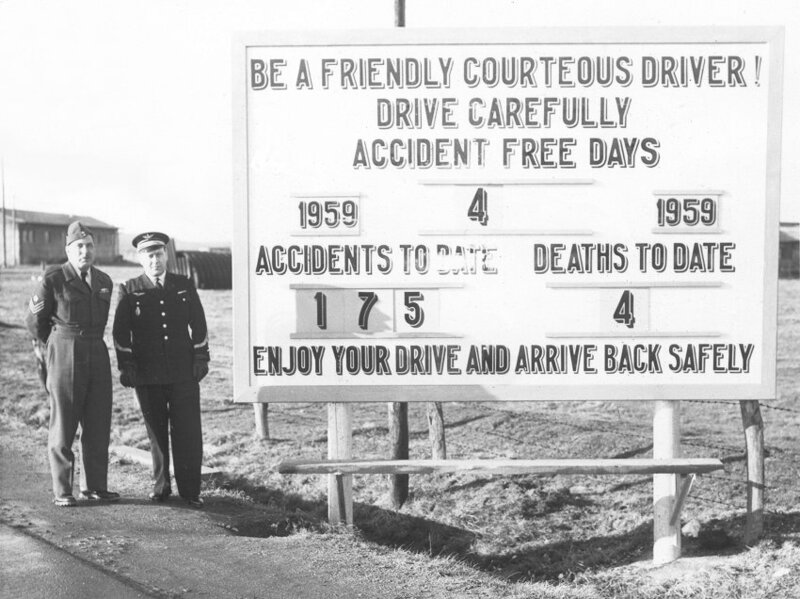 The Taffic Accident board at the gate when leaving the base - June 1962. 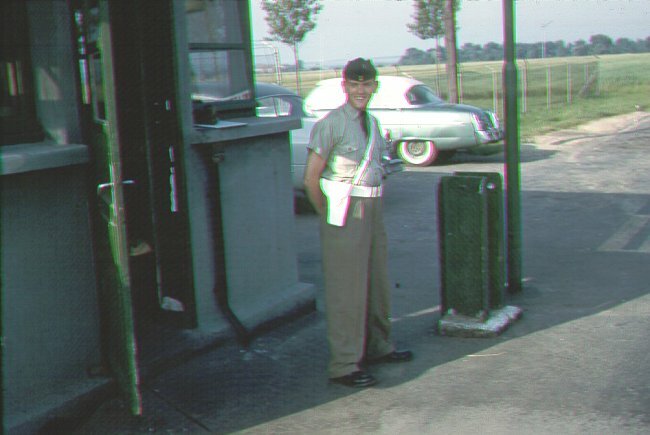 Lucien St-Hilaire on duty at the main gate - June 1962. 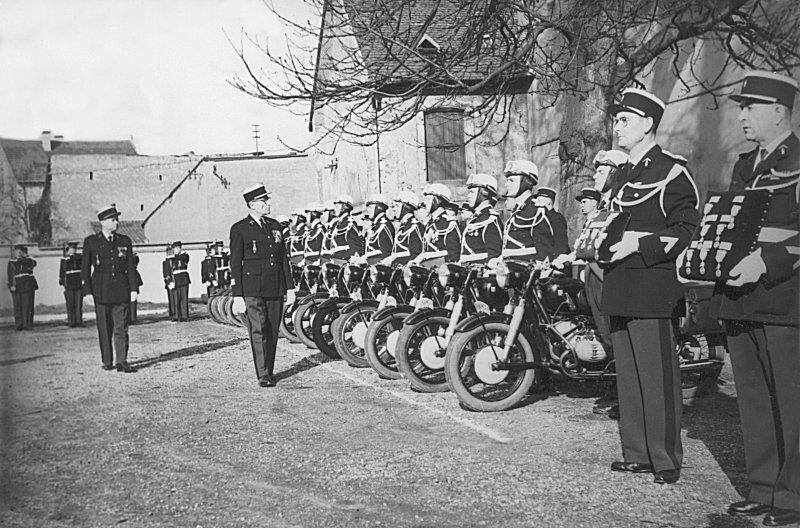 French Gendarme inspection in Faulquemont - 1962. 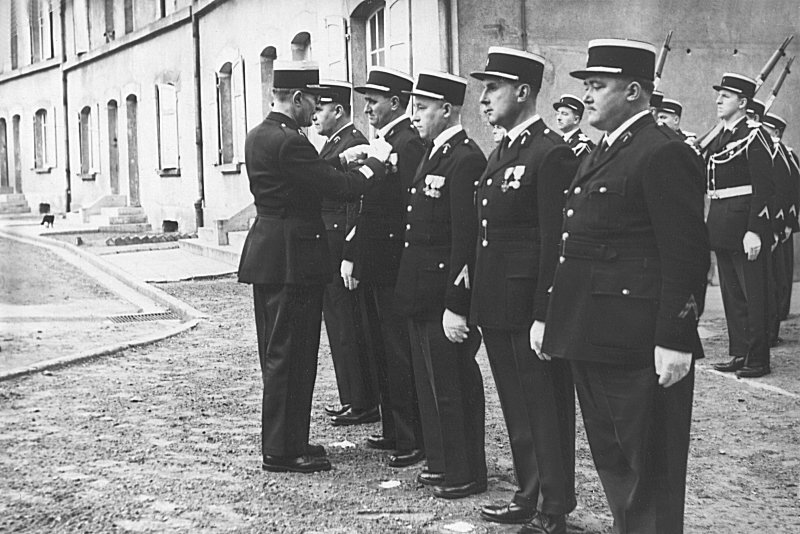 French Gendarme inspection in Faluquemont - 1962. 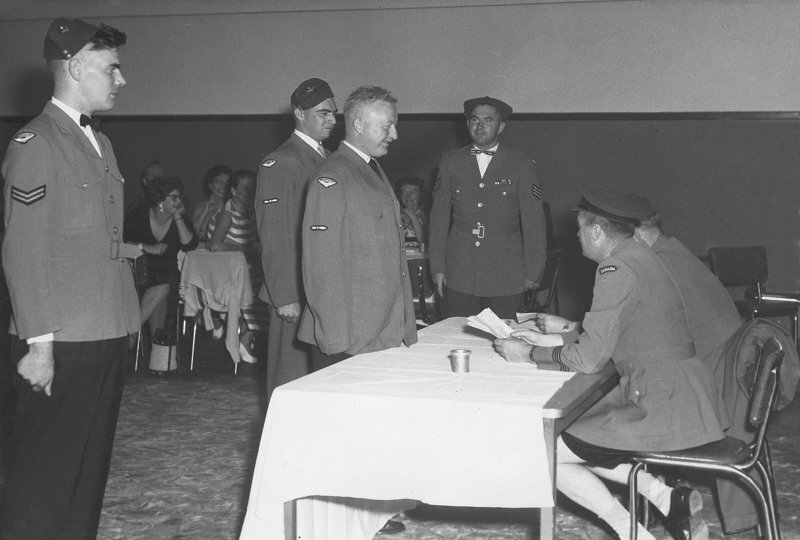 RCAF AFP personnel were often invited to such functions which included the awarding of medals, retirements, arrival of a new chief of police etc. 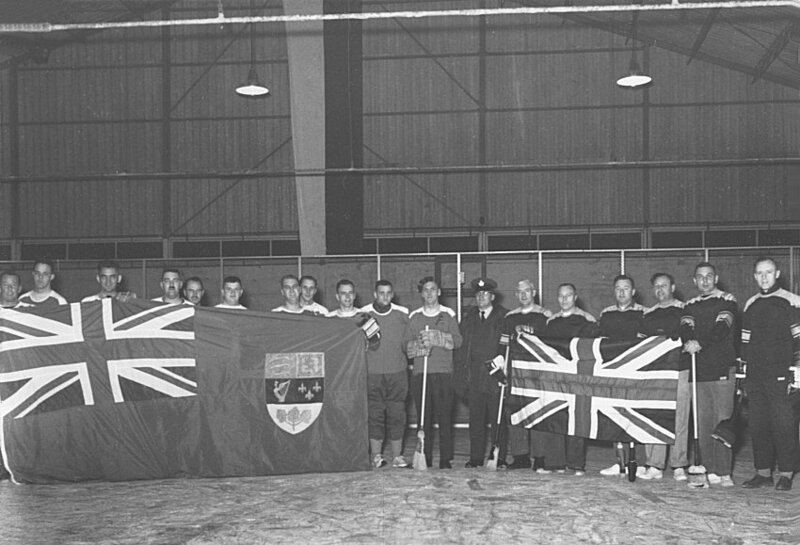 Efforts were made to maintain good relations by both sides. 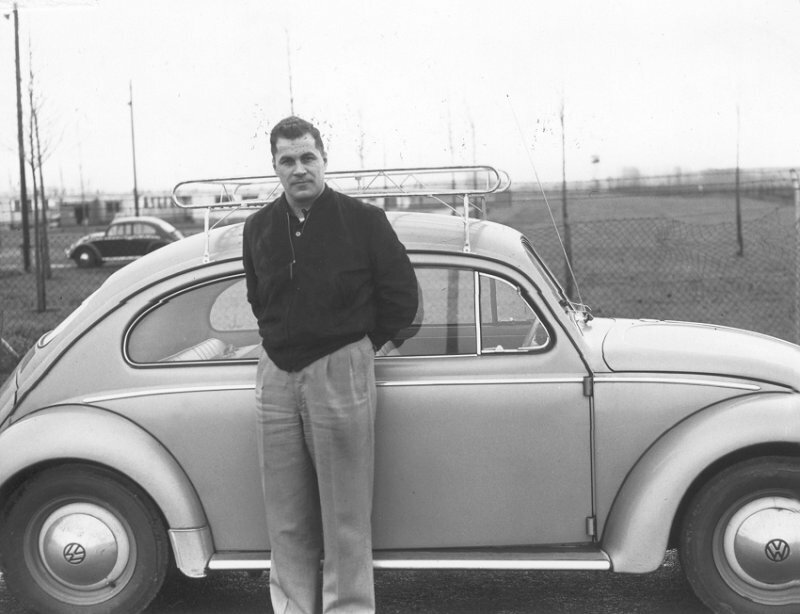 "Poor Canadian drivers", who were caught, were always an important topic of discussion. 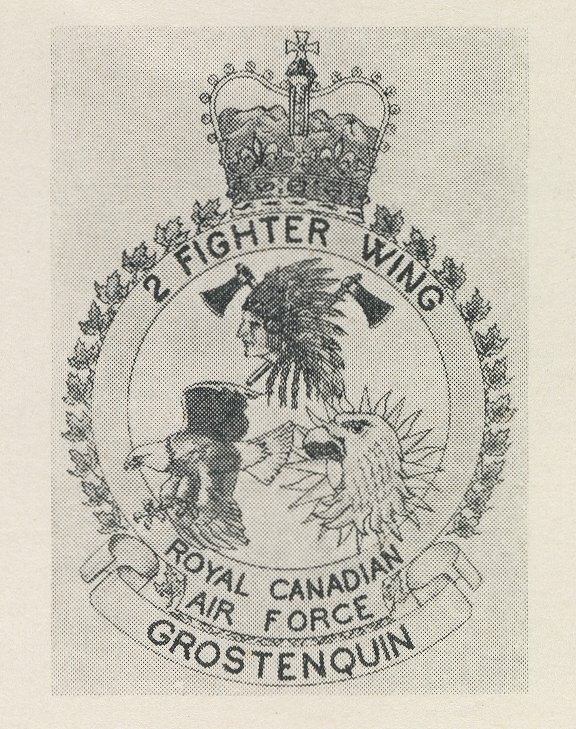 A badge presented to F/L V Heyes (WSecO) as a momento of French and RCAF friendship - 1962. This was worn of the chest belt of the motorcyle gendarmes (see previous photo). 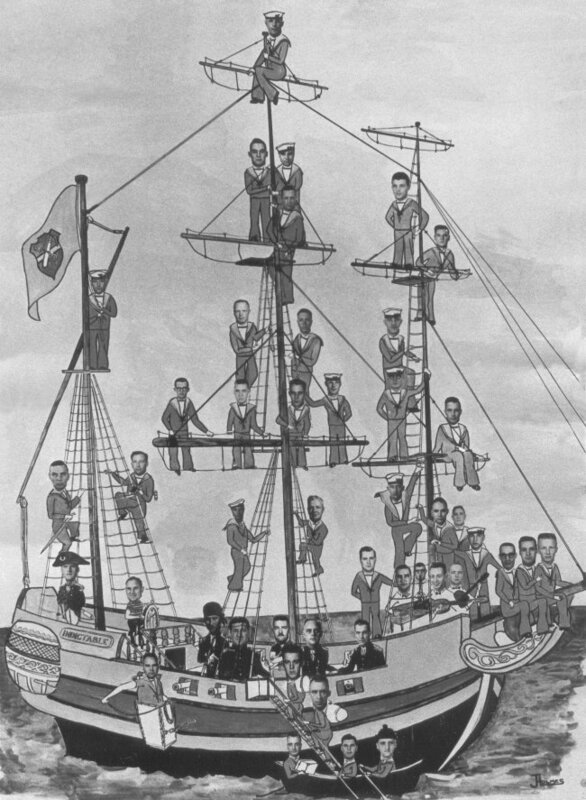 The "three bird" symbol identified the local Faulquemont detachment. 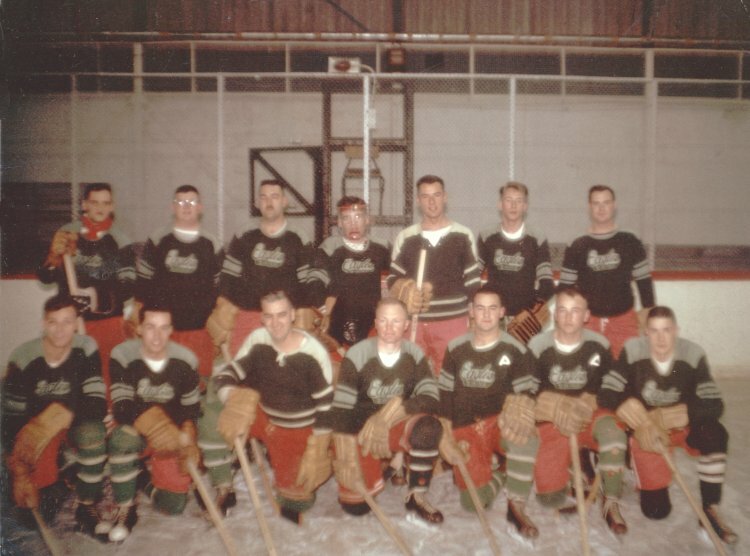 Christmas card - December 1961. 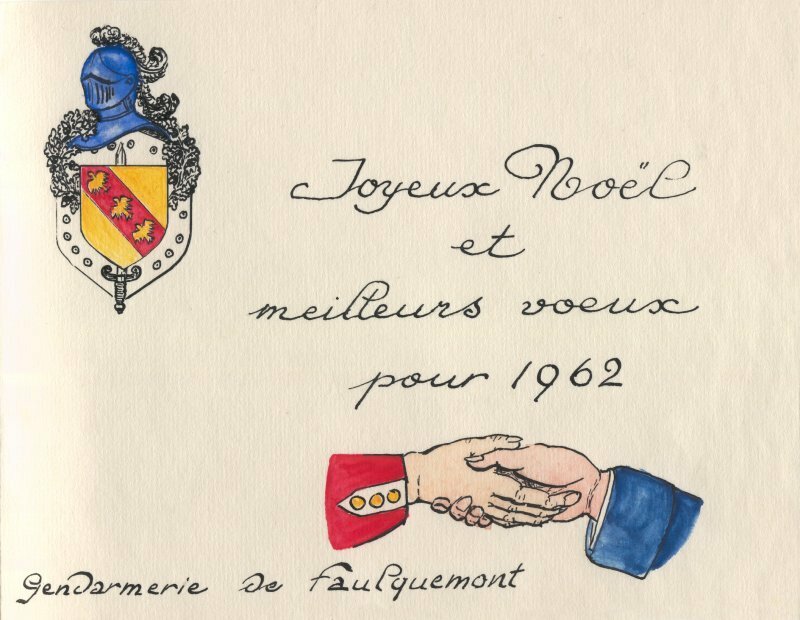 Larger image of the crest on the Christmas card - December 1961. 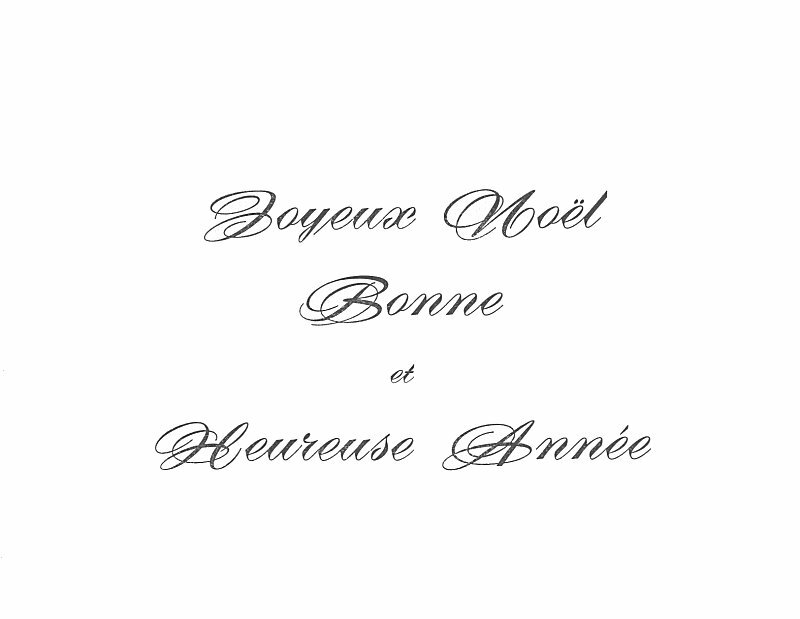 Interior page of the Christmas card - December 1961. 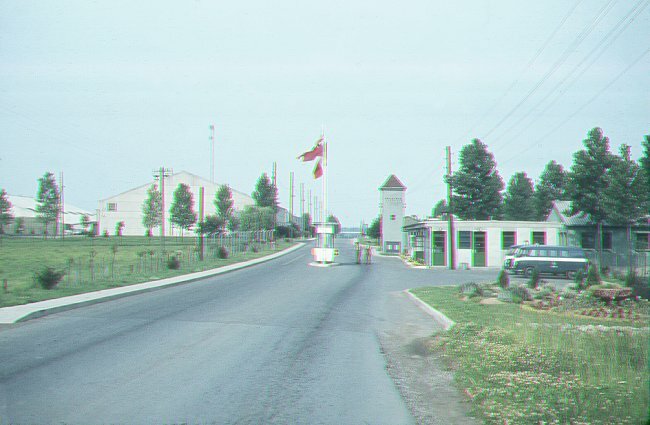 Lucien St-Hilaire on duty at the main gate - June 1961. 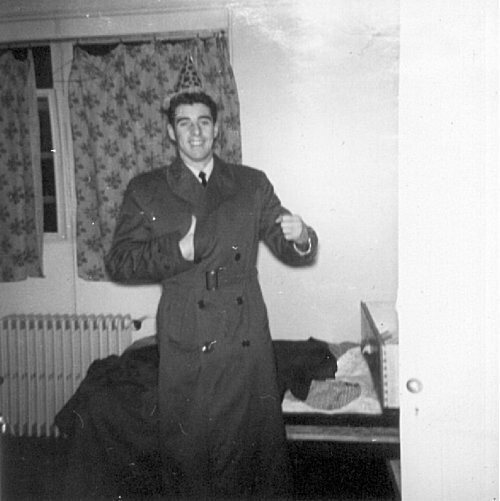 The Wing Security Officer "catching flies" on Christmas Day - 25 December 1961. 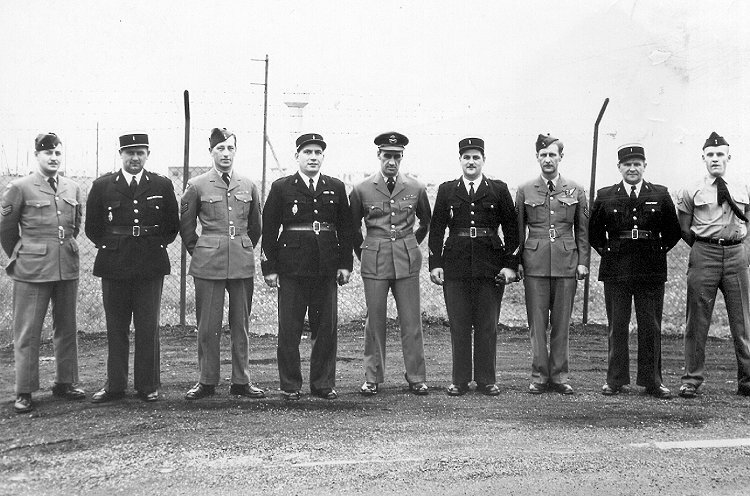 (L-R) - Sgt Jim Walker (CE Section), G/C RE MacBride (CO), unknown, unknown, F/L Victor Heyes, unknown, unknown. 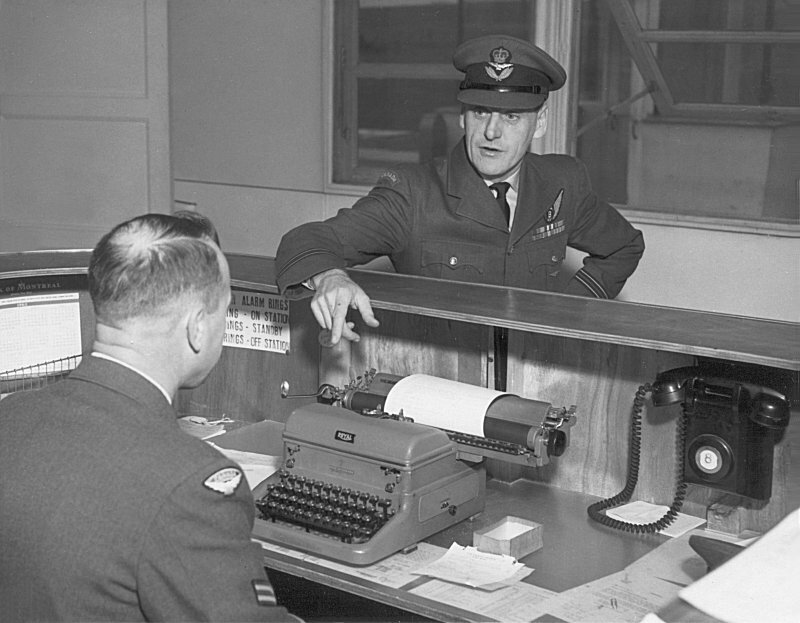 Glen Warner, AFP, preparing for another shift - April 1961. 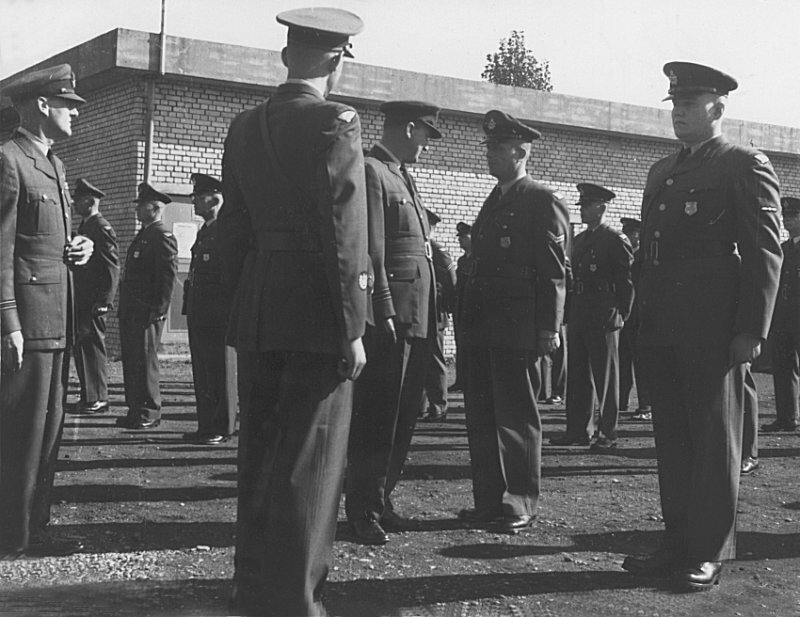 Inspection of AFP personnel - 1961. 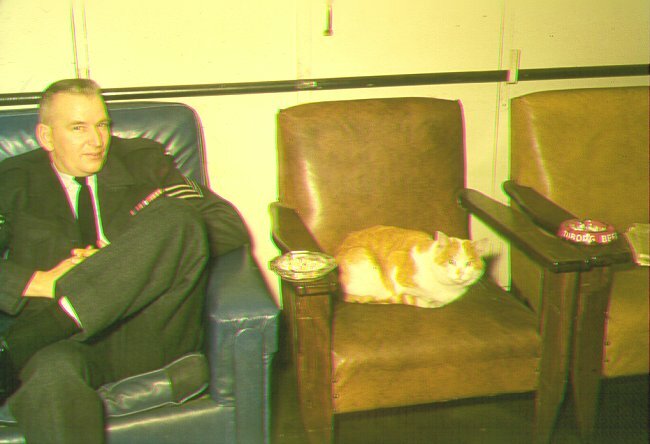 F/L Victor J Heyes (far left), WO2 AE "Lucky" Grenzowski (back to camera). 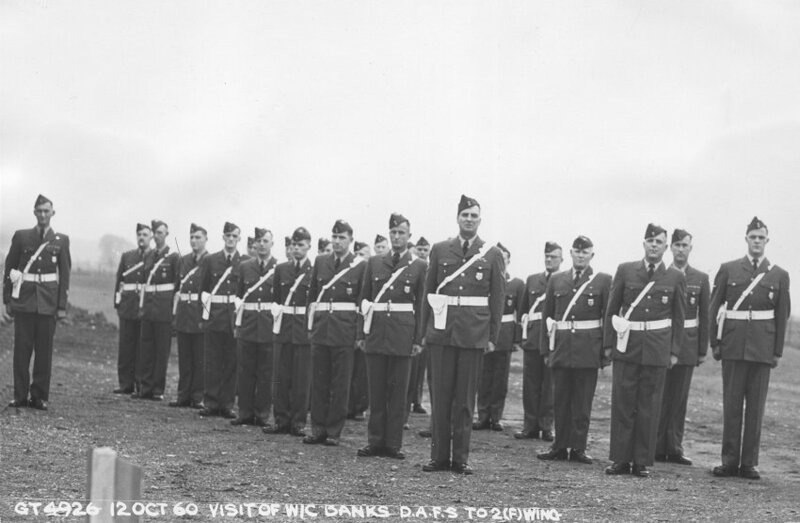 Visit of W/C Banks (DAFS) to 2 (F) Wing - 12 October 1960. 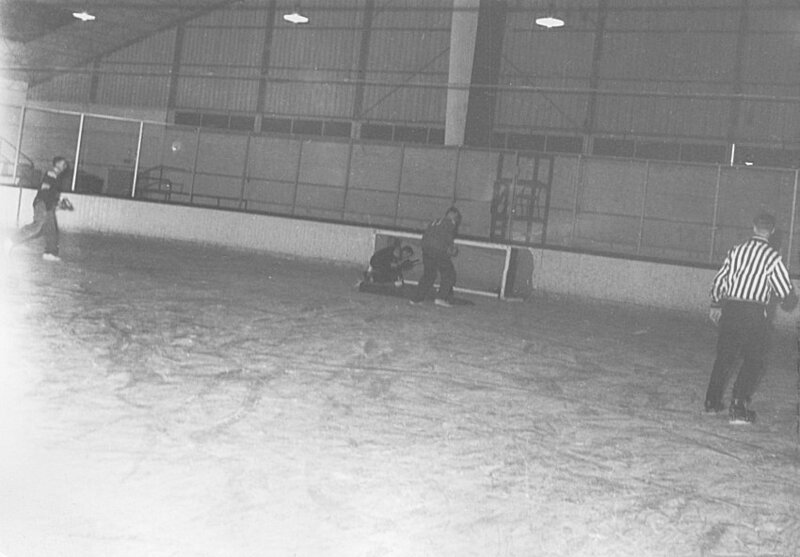 Larger image of the previous photo - 12 October 1960. 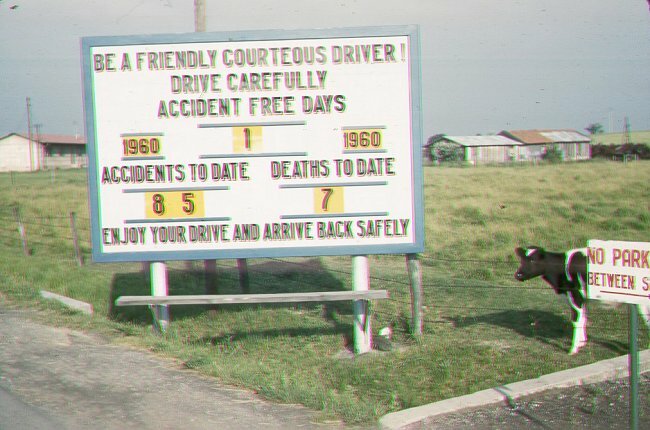 The Accident Board at the exit of the station - August 1960. 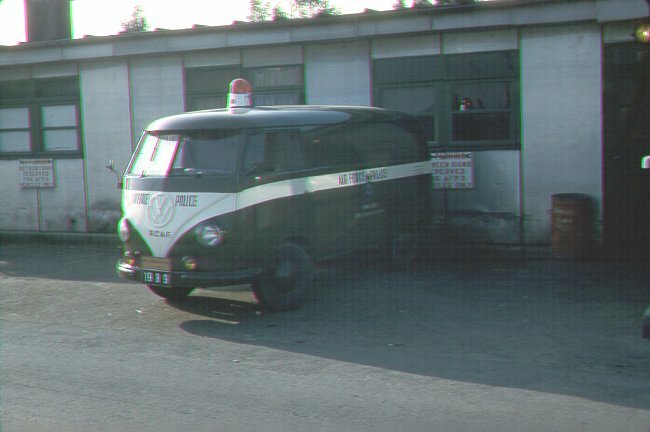 The Guard House at the main gate with the AFP vehicle parked outside - June 1960. 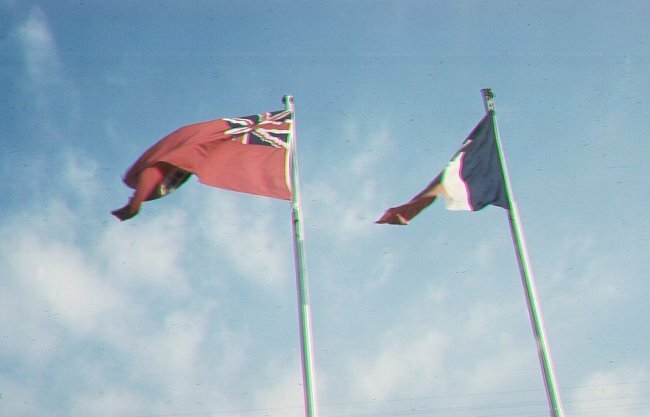 Canadian Red Ensign and the French flags by the main gate - June 1960. 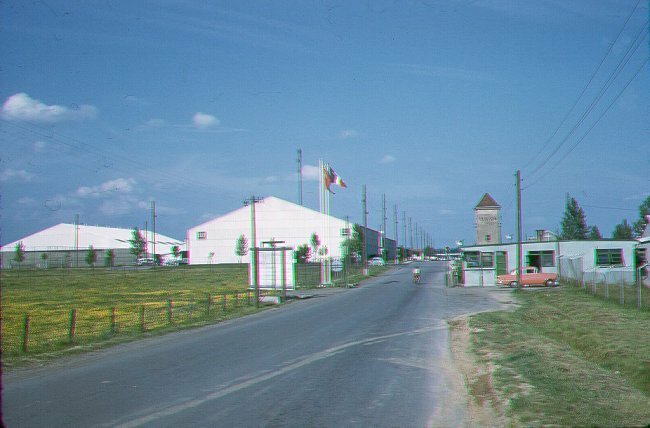 Approaching the main gate - April 1959. 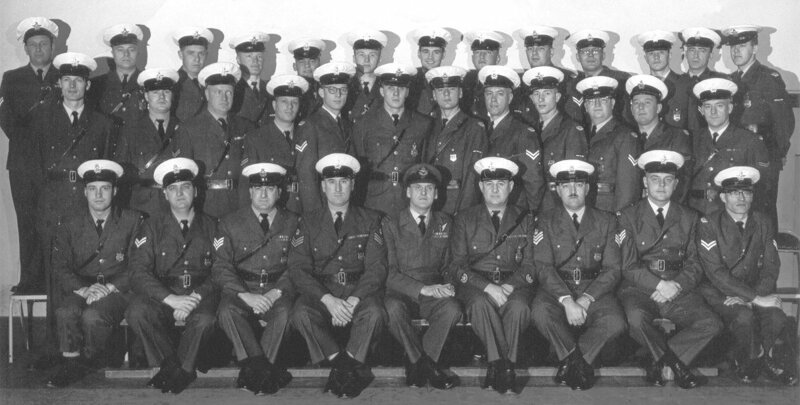 Air Force Police personnel - March 1959. 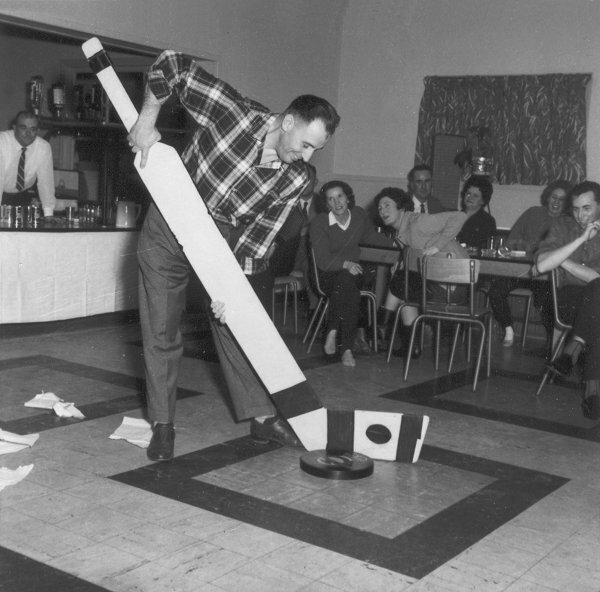 Another skit held at an AFP party - 1959. 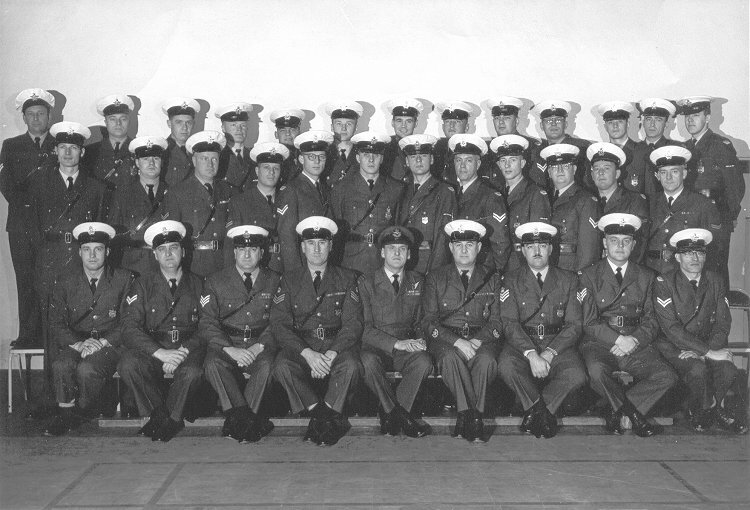 F/L WF Ludlam (4th from left). 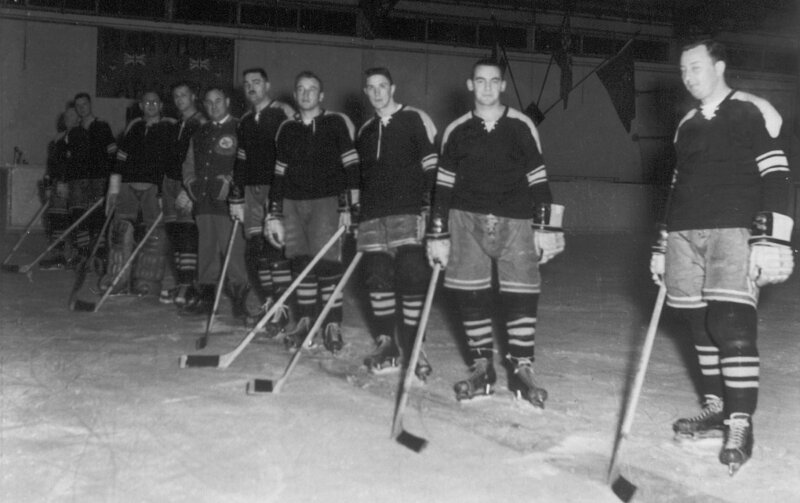 Unidentified AFP personnel heading back to Canada - 1959. 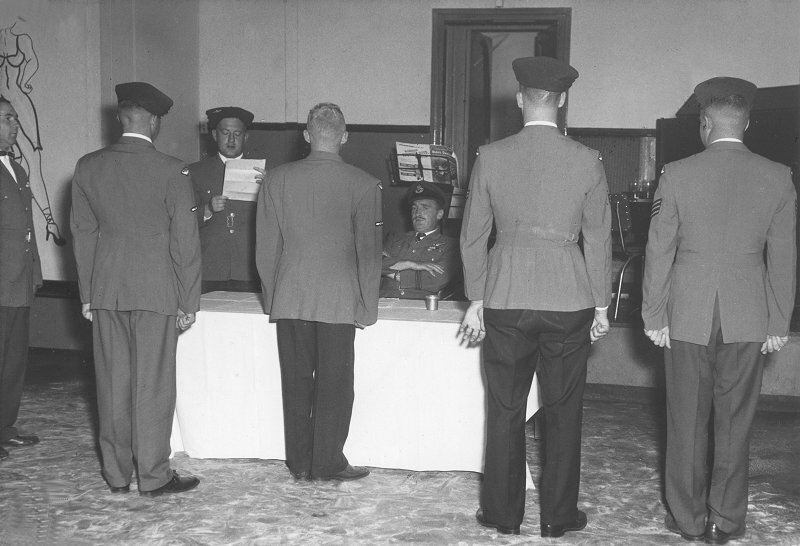 The "reading of the charges" during a mock court-martial - 1959. 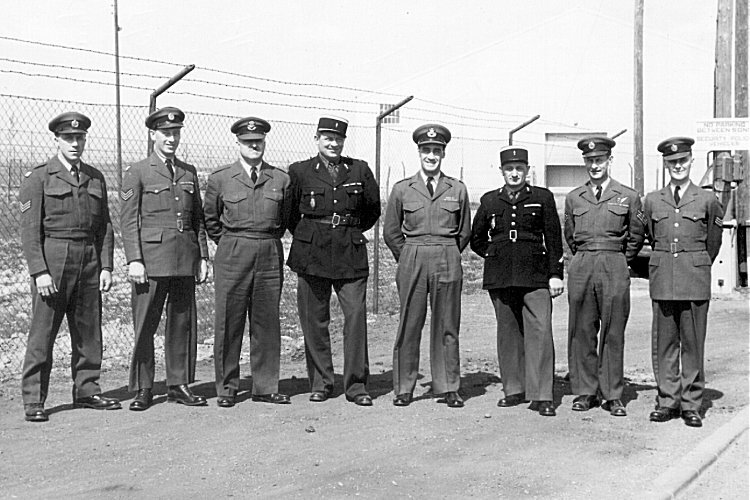 WO2 AE "Lucky" Grenzowski (3rd from left), F/L WF Ludlam (5th from left). 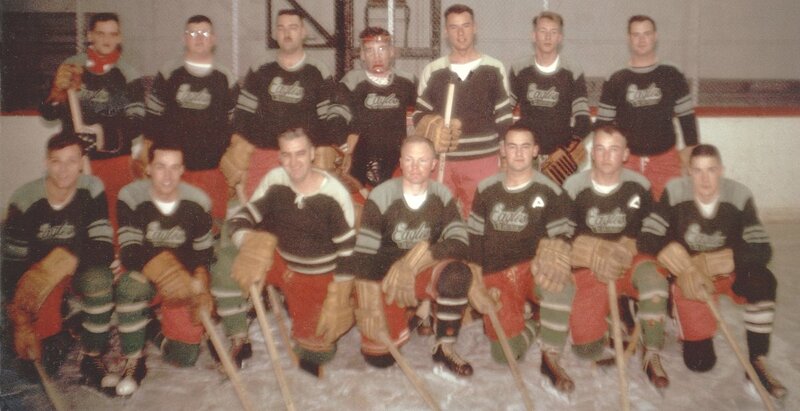 This is a very serious charge - 1959. 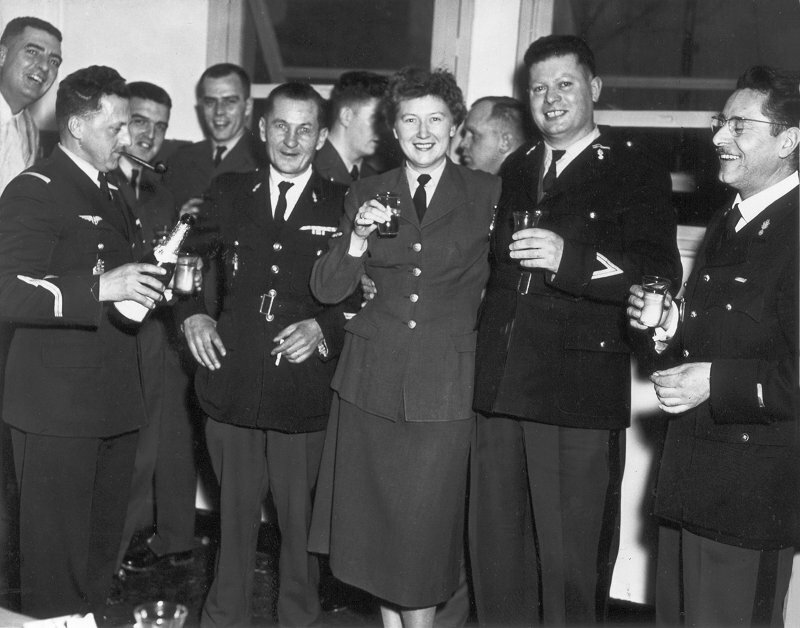 WO2 AE "Lucky" Grenzowski (2nd from left), F/L WF Ludlam (5th from left). 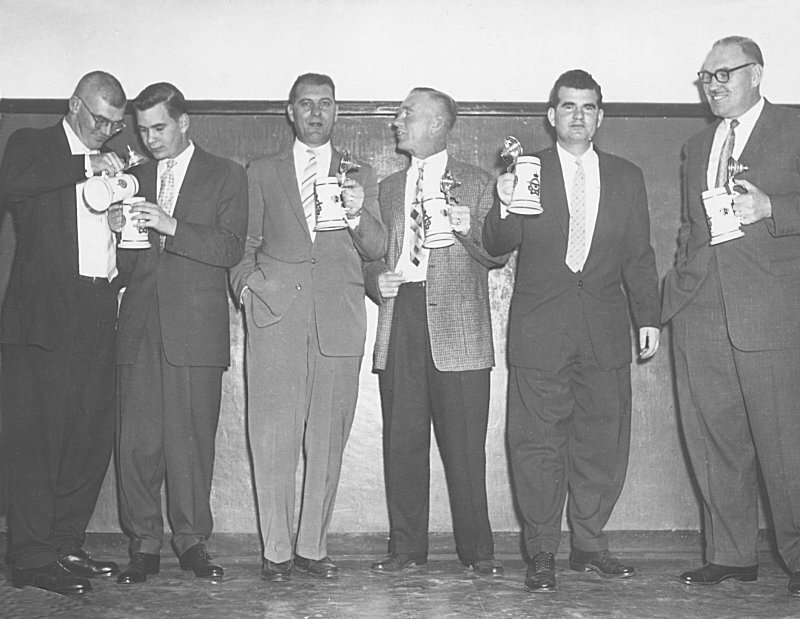 The "passing of the sentence" - 1959. Hup, two, three, four - 1959. 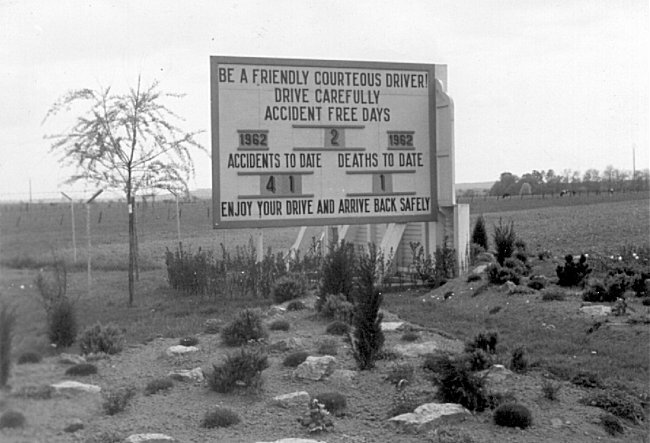 The "Accident Free Day" sign by the main gate - 1959. 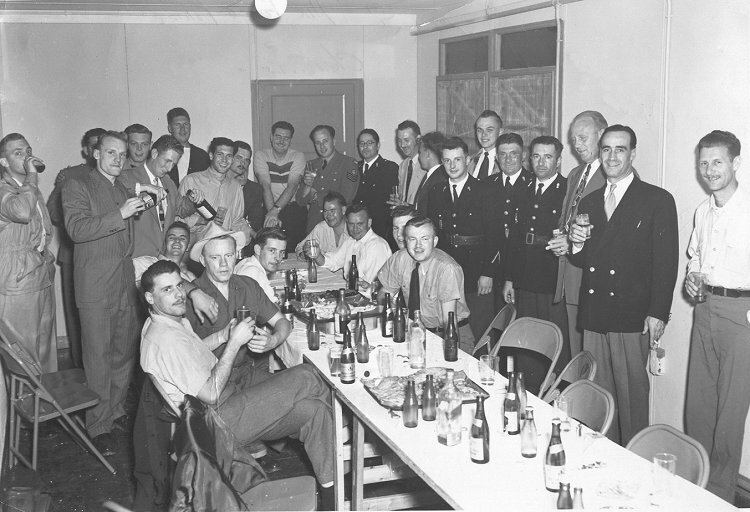 Yet another party for the Gendarmes - 1959. 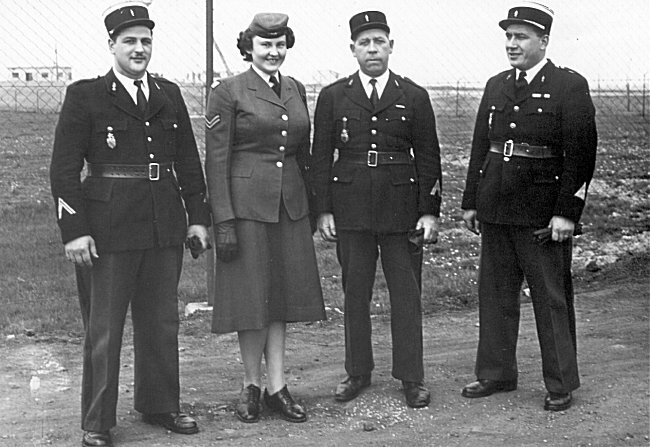 Unidentified female AFP with her Gendarme friends - 1959. 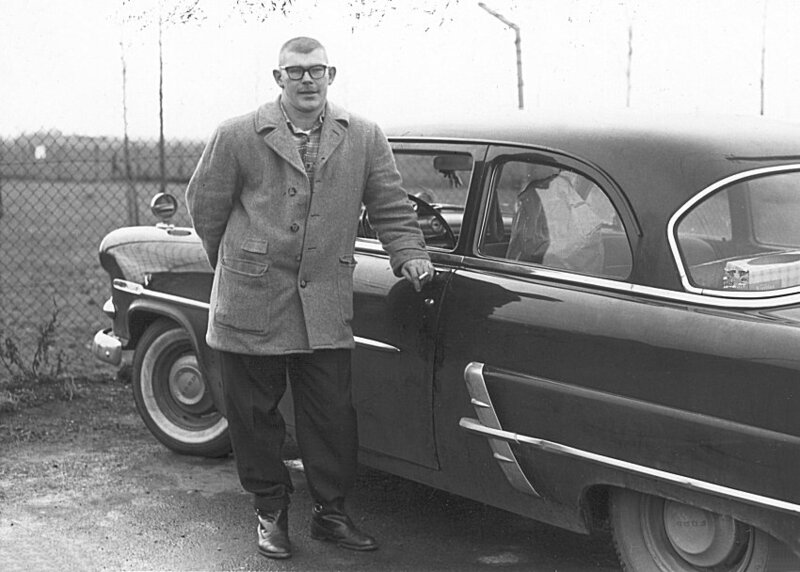 Unidentified AFP by his car, heading back to Canada - 1959. 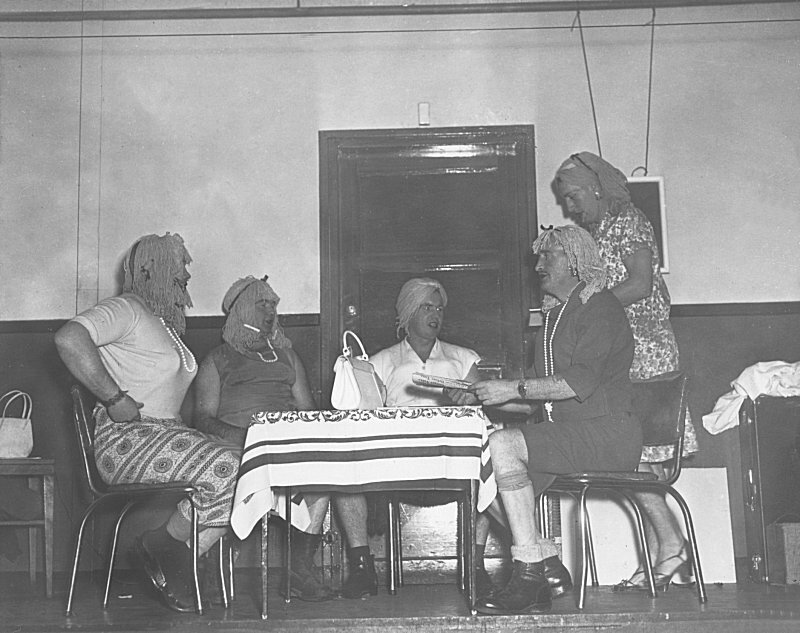 Unidentified wives of AFP personnel "hamming it up" - 1959. 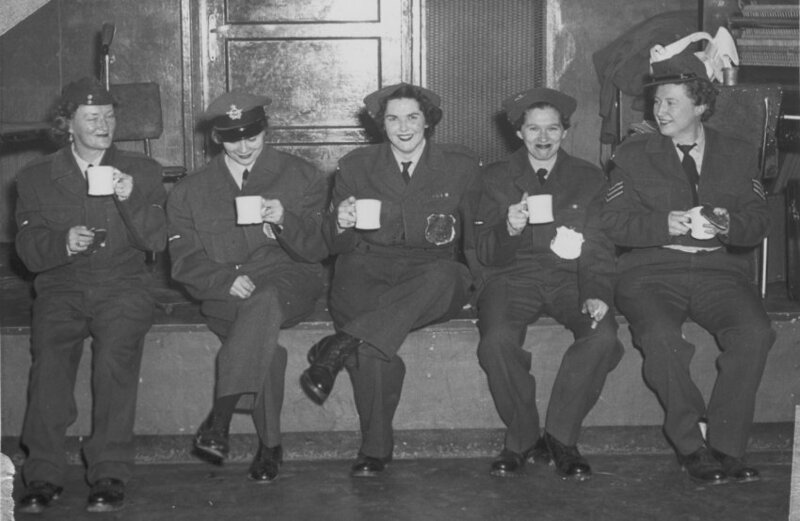 AFP personnel (with their mugs) heading back to Canada - 1959. 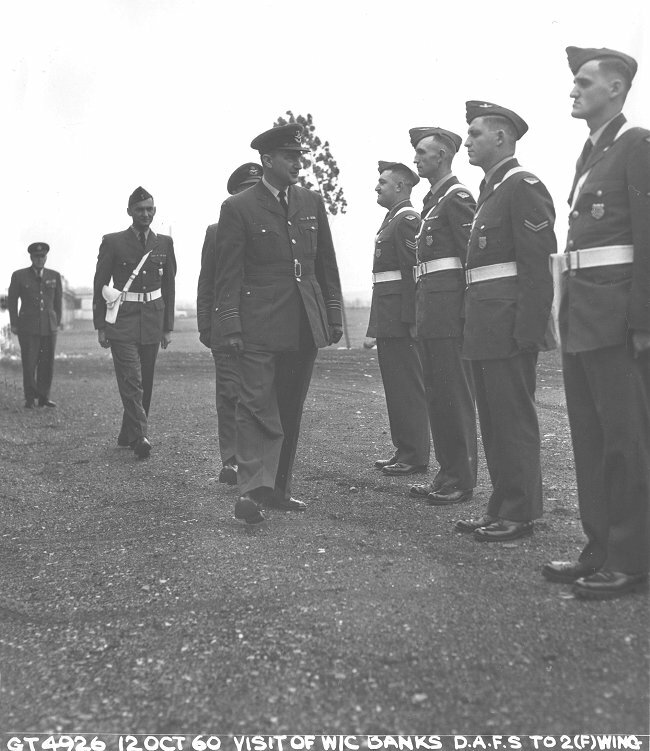 Inspection of AFP personnel at 2 Wing Grostenquin - 1959. 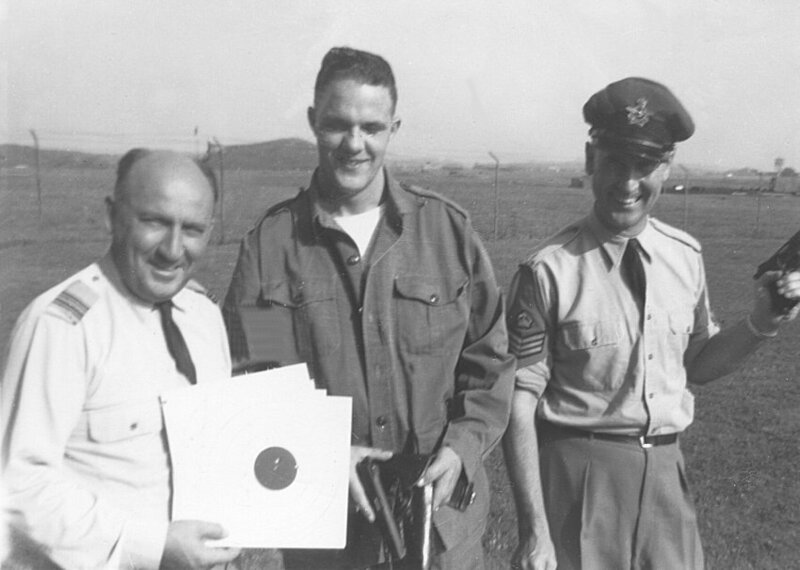 WO2 AE "Lucky" Grenzowski (far left), F/L WF Ludlam (WSecO - centre), G/C AB Searle (Base Commander). 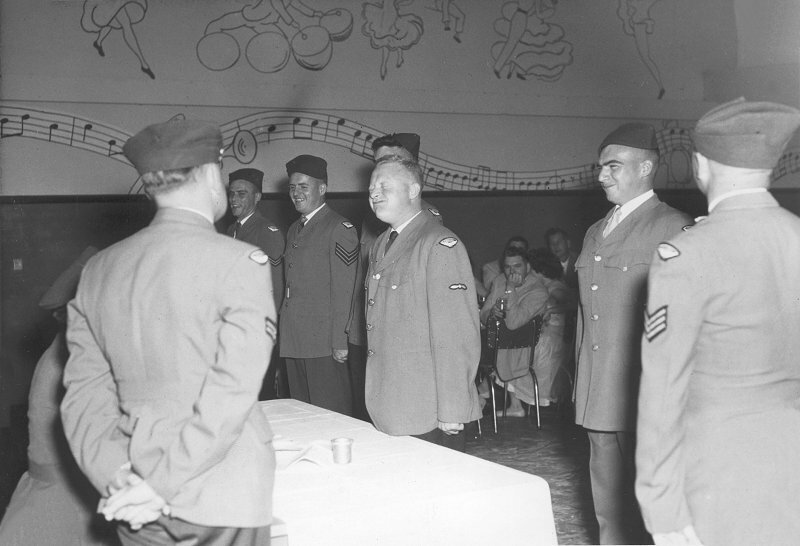 Sgt Red Warman presenting the mug to Cpl Gord Delaney at a farewell party - 1958. 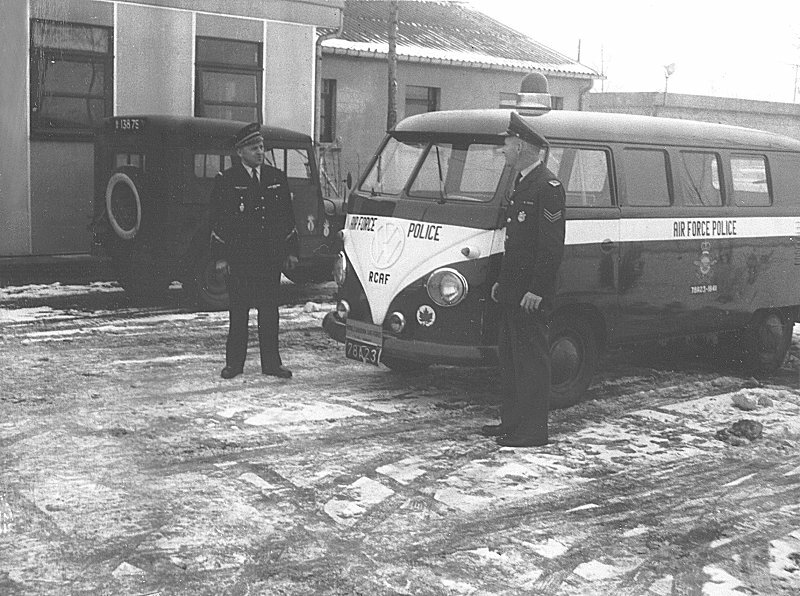 French Gendarmes and RCAF military police personnel by the main gate - March 1955. 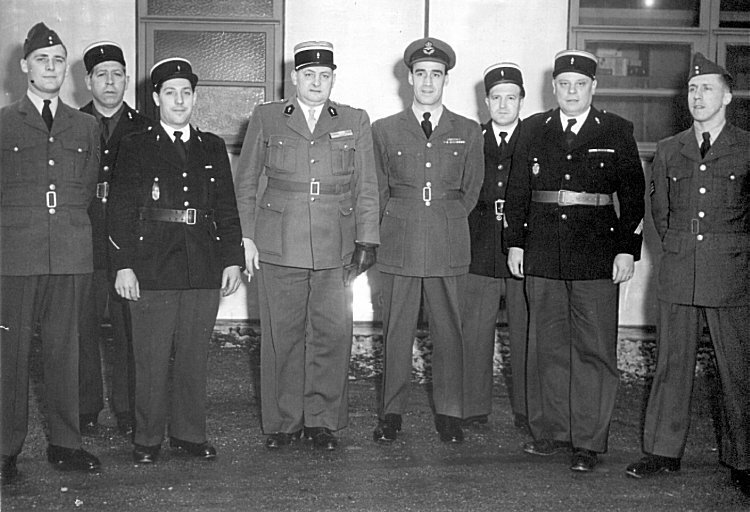 (L-R) - Sgt Dave Wally, Gendarme Renoldi, gendarme Gauthier, unknown French Gendarme Commandant, F/L M Labrosse (Wing Security Officer) gendarme Schafner, Chef Gendarme Ed Mutz, Sgt Gaston "Moose" Migneault. 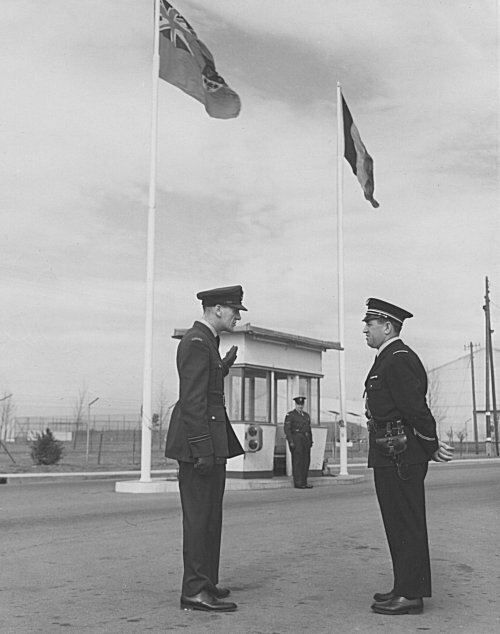 French Gendarmes and RCAF military police personnel by the main gate - October 1954. 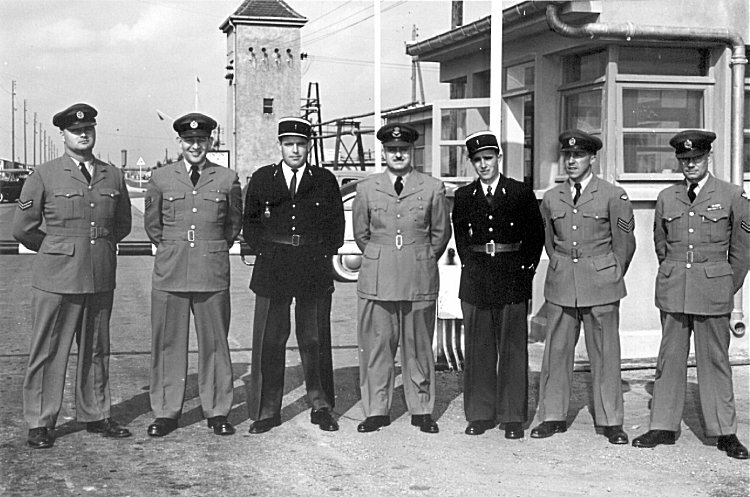 (L-R) - Gendarme Bassot, Sgt Ed Boyd, Gendarme B Rinoldi, FS Art Case, Chef Gendarme Edward Beingue, Sgt Dave Wally. 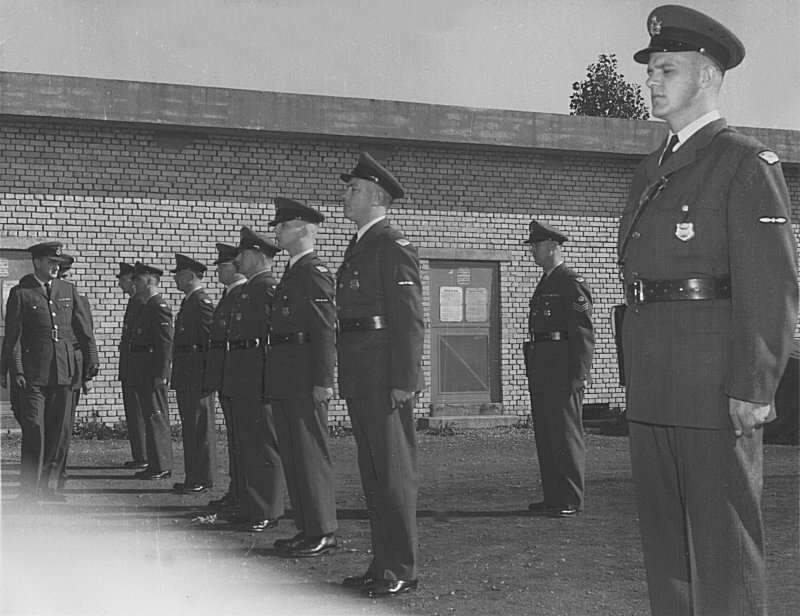 French Gendarmes and RCAF military police personnel by the main gate - August 1954. 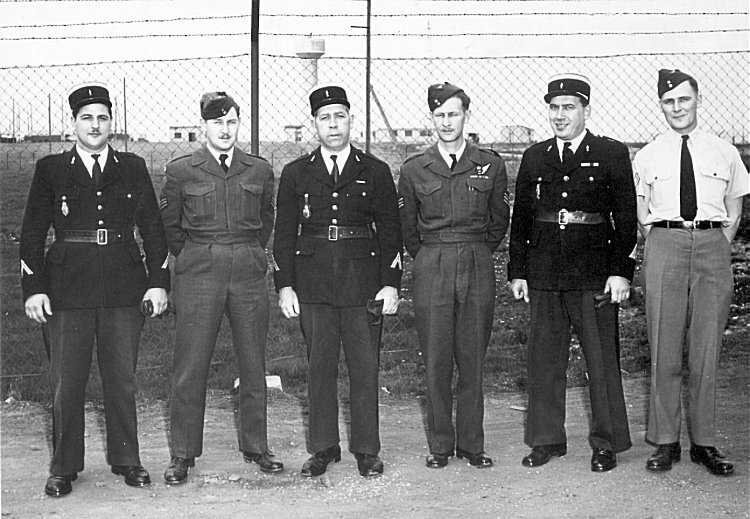 (L-R) - Unknown Cpl, Sgt Sloan, unknown gendarme, F/O Yvon Ratelle (Wing Assistant Secutiry Officer) unknown gendarme, Sgt Gaston Migneault, Cpl Freeman. 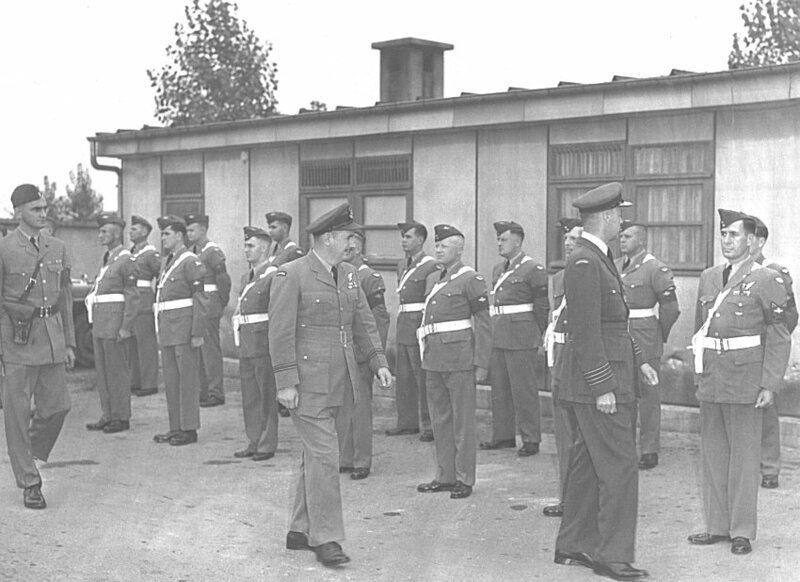 French Gendarmes and RCAF military police personnel by the main gate - July 1954. 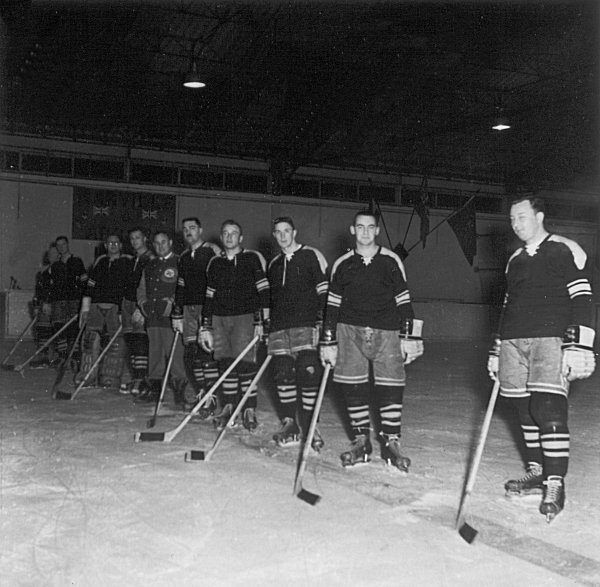 (L-R) - Cpl Freeman, Sgt Jos Trepanier, gendarme Dupuis, F/O Ratelle, unknown gendarme, FS Art Case, Sgt Gaston Migneault, Sgt Sloan. 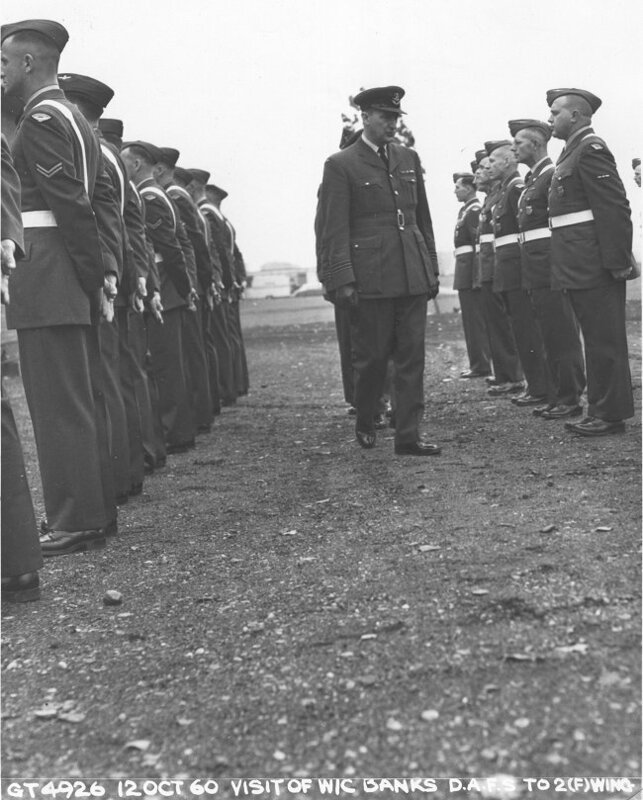 French Gendarmes and RCAF military police personnel by the main gate - 1 June 1954. 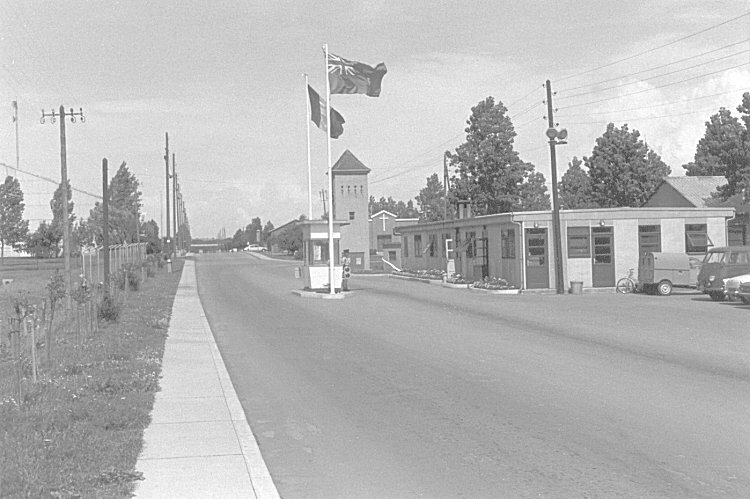 The main gate and guard house for 2 Wing - May 1954. 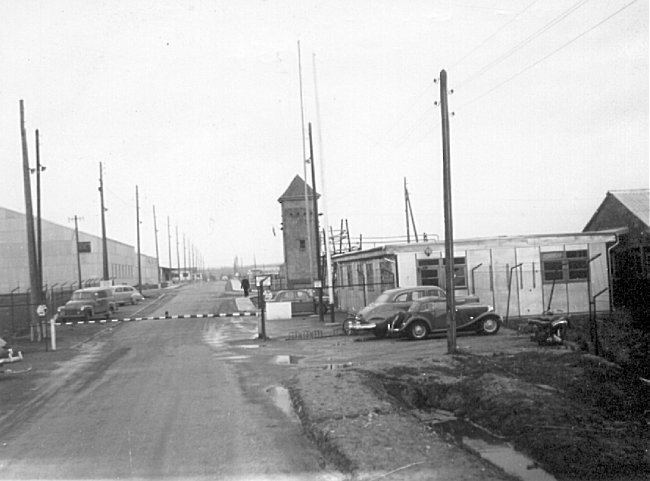 The main gate to the Station - April 1954. 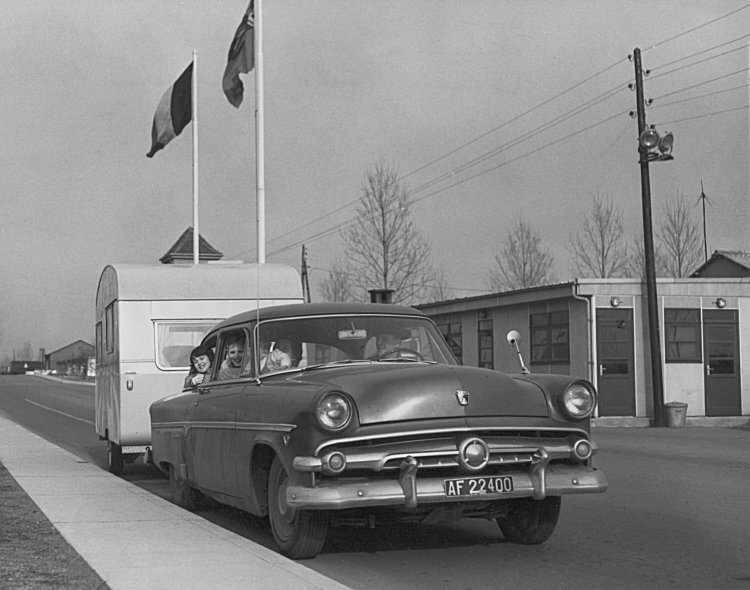 French Gendarmes and RCAF military police personnel by the main gate - April 1954. 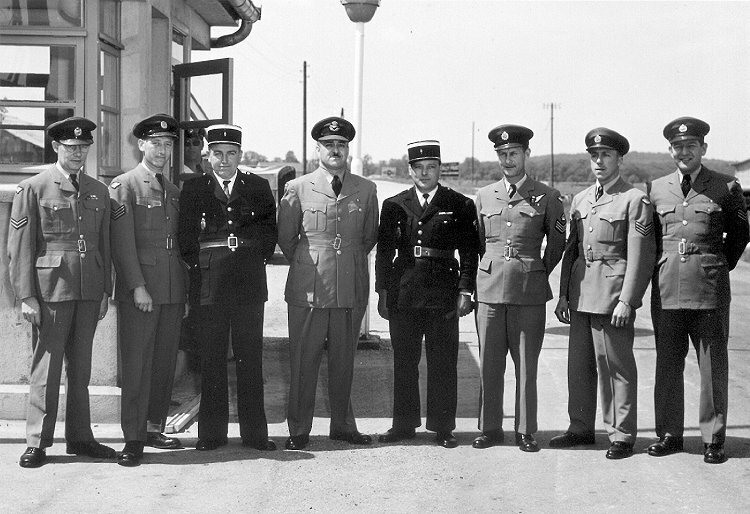 (L-R) - Sgt Gaston Migneault, Sgt Jos Trepanier, F/O Y Ratelle, Gendarme Pastel, F/L M Labrosse (Wing Security Officer), unknown gendarme, FS Art Case, Sgt Dave Wally. 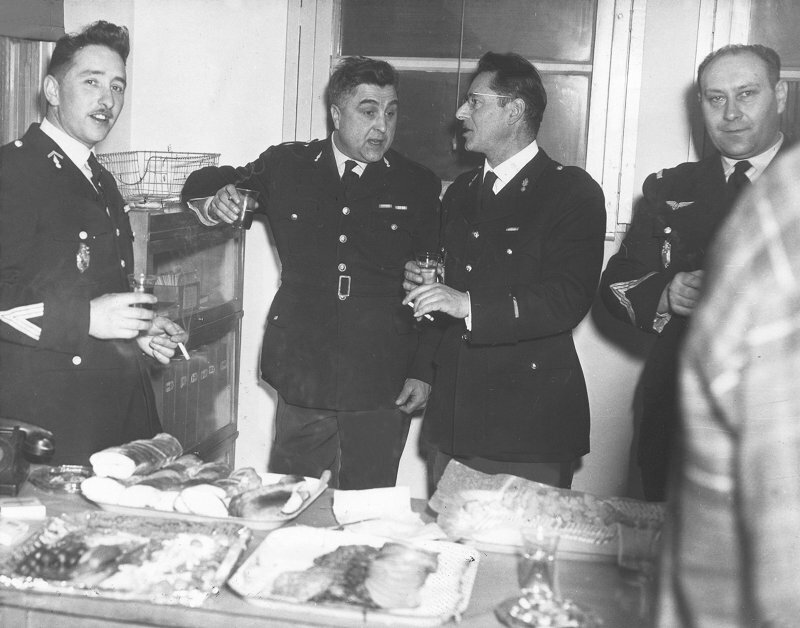 Gendarme Bassot, Cpl Stella Barsa (AFP), Gendarme Binaldi, Chef Beringue at the main gate - March 1954. 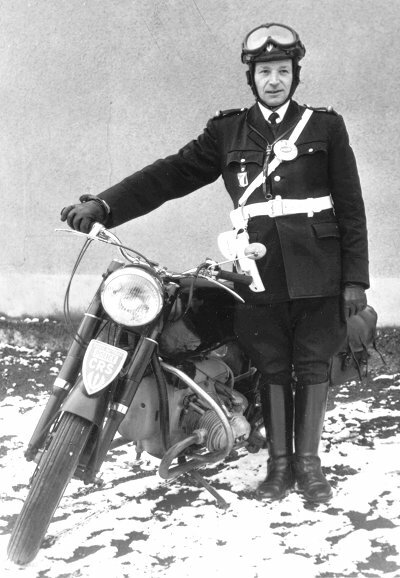 Marius Pierret (Gendarme) Surete Nationale Francaise - January 1954. 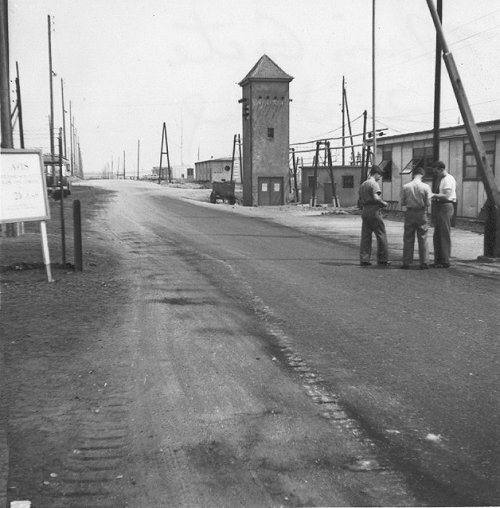 The main gate of the station - April 1953. Personnel at the main gate. 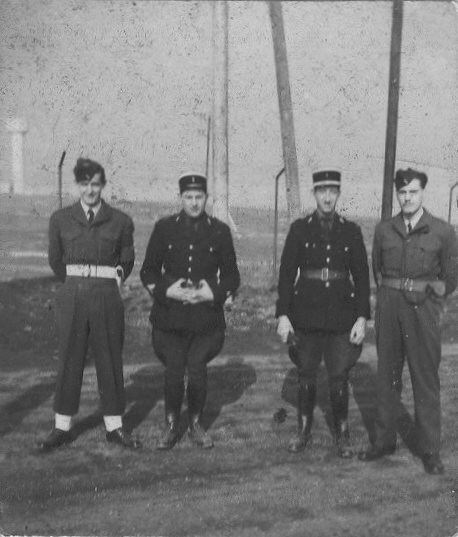 (L-R) Cpl Delaney, unidentified Gendarme, unidentified Gendarme, Cpl Brooks - February 1953. 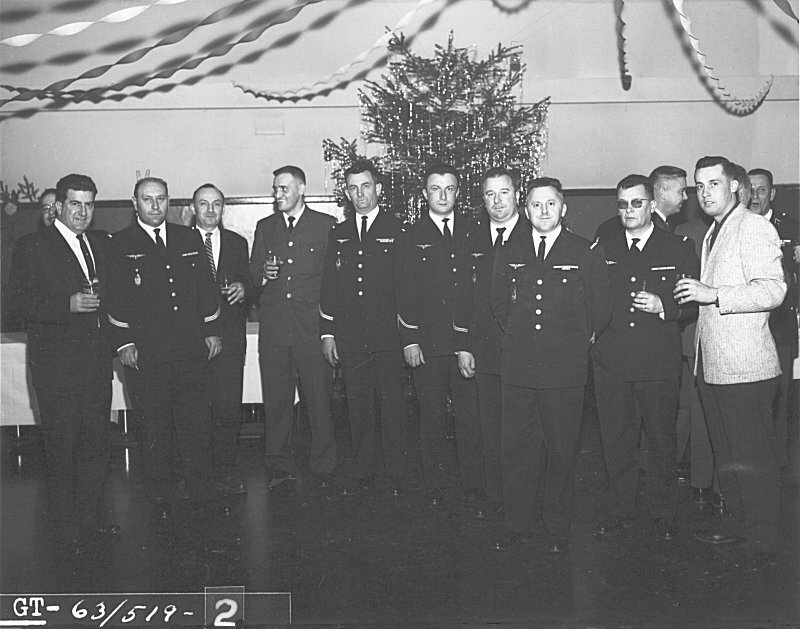 Air Force Police Christmas party - December 1952.